‘Respond to every call that excites your spirit” said Rumi and so I did. 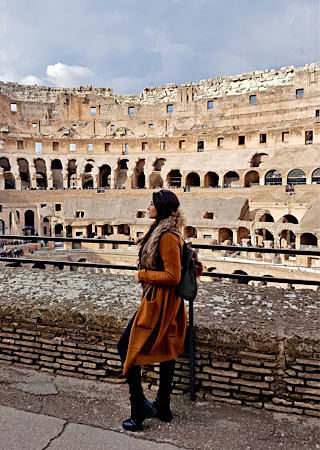 Exploring unique destinations and meeting new people brings me immense happiness, it introduces me to a new life each time and I end up feeling like a different person with every journey, it’s something I’m truly passionate about. 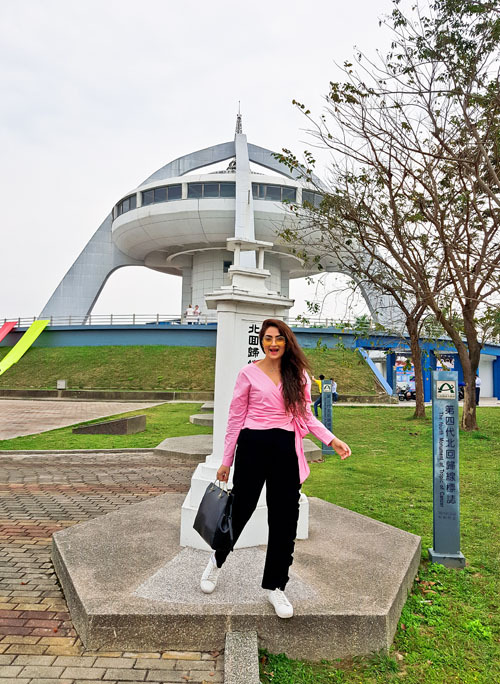 So Taiwan had been on my travel list since a long time and when the tourism board invited me to visit this island nation I plunged right into it. 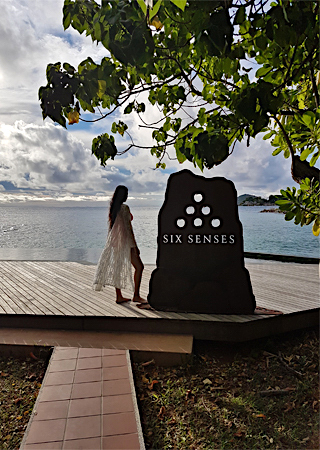 As soon as I received a fun seven day itinerary from them, I was waiting to board the flight and explore Asia’s best kept secret. 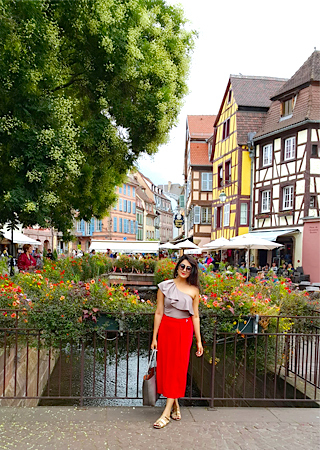 I was thrilled that we were going to visit a new town every single day and switch from luxury hotels and leisure farms to beautiful countryside spots. 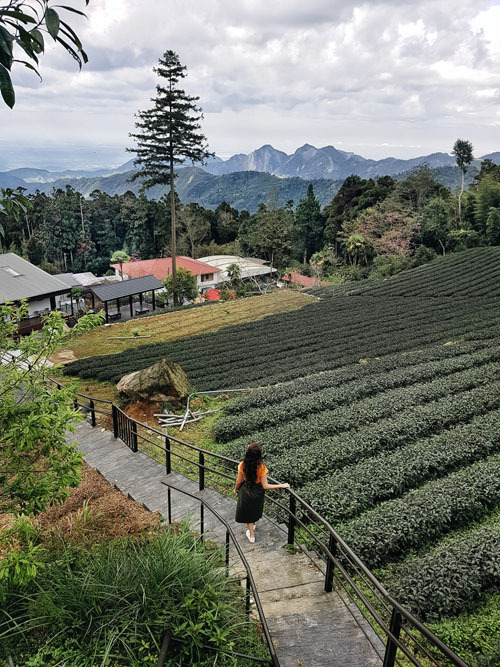 Generally off the radar for anyone planning their trip to that side of the world, Taiwan is definitely an undiscovered piece of paradise. 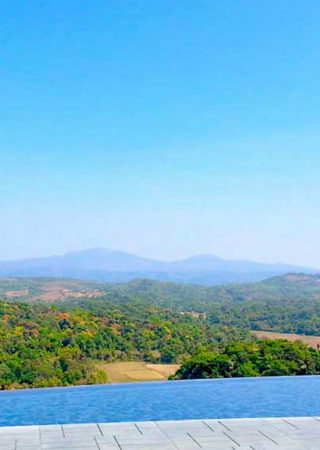 It boasts a large land of wilderness, wide expanses of green and picturesque national parks, rising skyscrapers, a ruling economy, majestic mountains, dramatic scenery and an air that seemingly transports you into a different world. 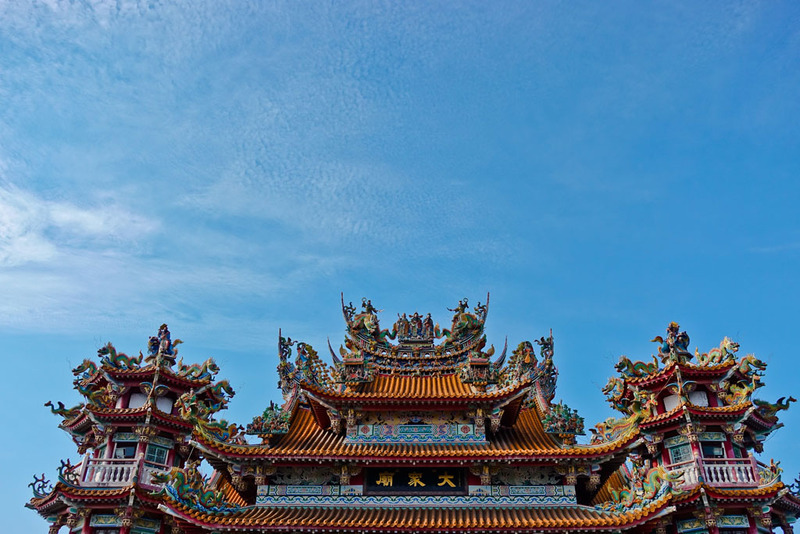 Taiwan offers too many marvellous sights, all within one single island. 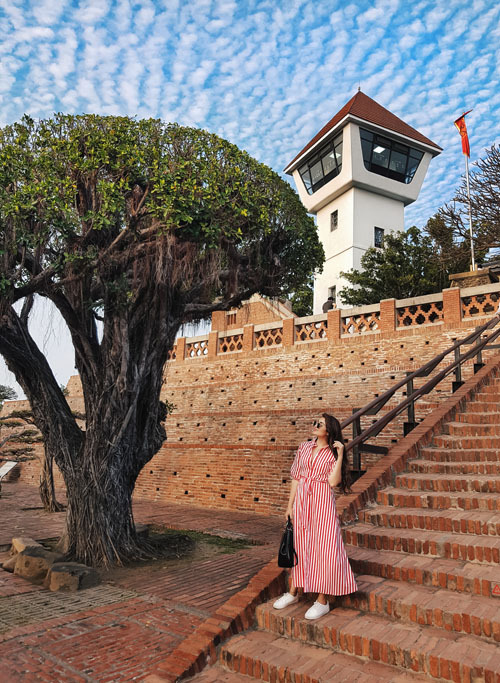 With sophistication, global economic success and scenic landscapes rising in every corner, the island is also home to thriving, deep-rooted history and cultural heritage. We flew direct from Dubai to Taiwan with Emirates and it was so comfortable. A few naps, three movies and eight hours later we landed in Taipei. I was so thrilled to be introduced to the rest of the media members from Dubai and Turkey. We were first treated with a delicious Moroccan dinner and then checked in to Grand Hyatt Taipei right after. 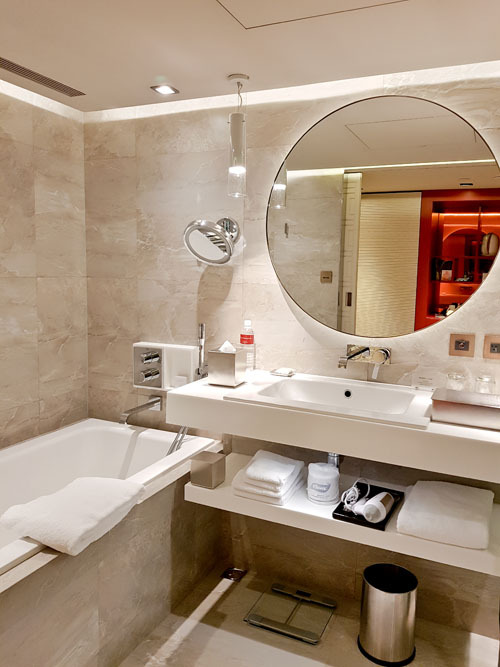 An epitome of royalty with a location accessible and convenient in the centre of the city, this luxurious accommodation was just what we needed. 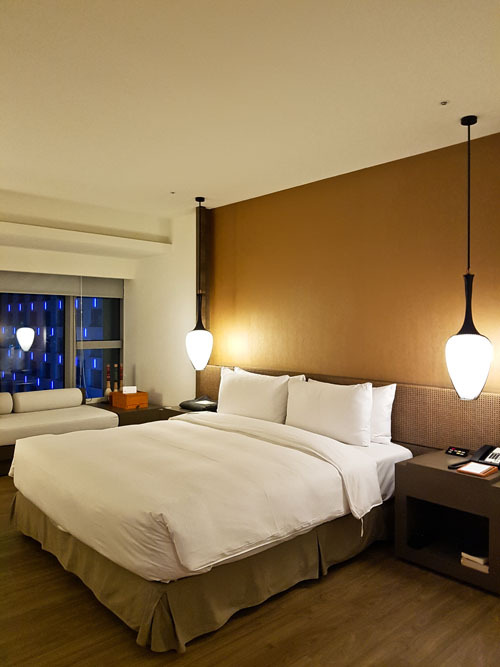 The hotel is built in close proximity to the famous Taipei 101 Tower with fascinating interiors and lively rooms that speak panache in every sense. 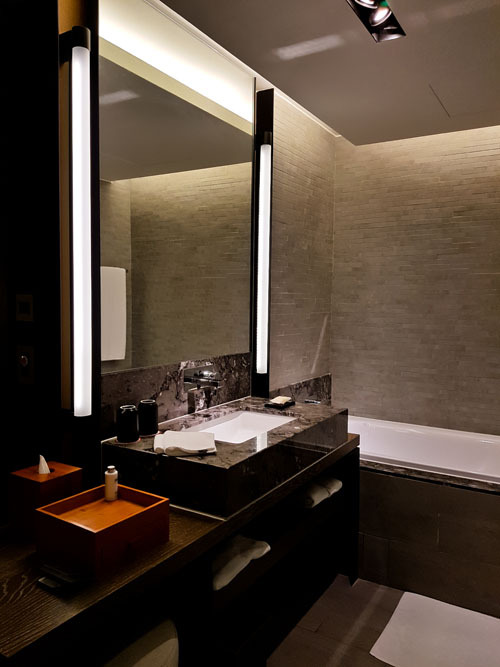 The room was plush, cosy and spacious with an earthy colour palette and a sleek marble bathroom. 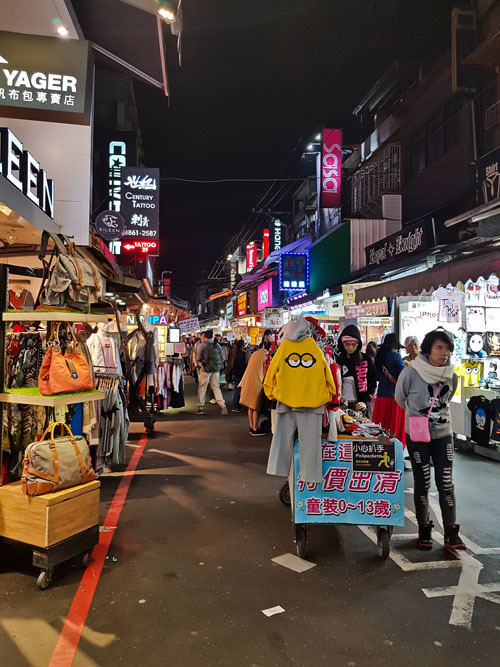 By the time we checked in it was 9:30 pm but the happy spirit within didn’t allow us to relax in the hotel so instead we decided to head out to one of the largest and most popular, Shilin Night Market. The taxi dropped us right at the start of the buzzing lane. 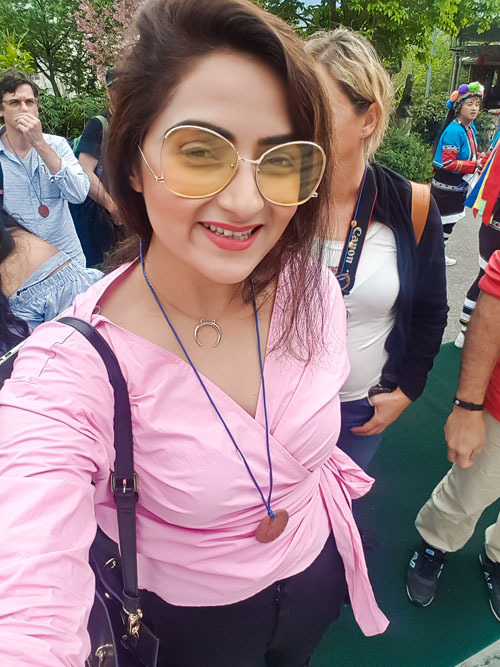 The street was lively with food stalls that served a lip-smacking array of local delicacies and vendors selling the best clothes for attractive prices. 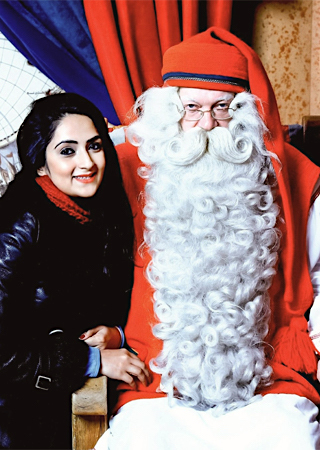 It was an absolute delight to just stroll around, window shop and get fascinated along the way. 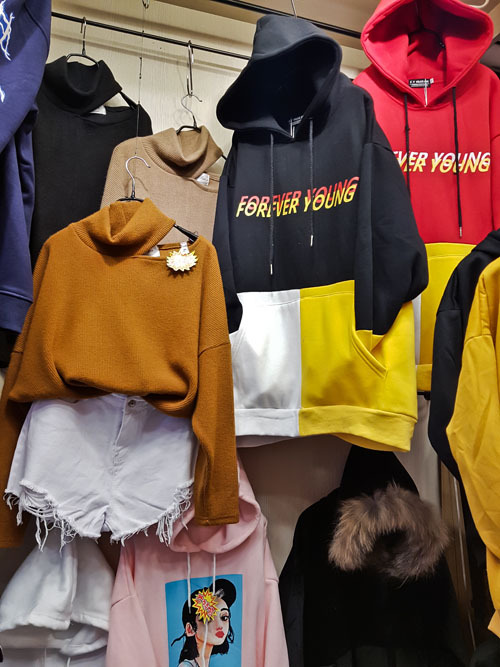 Here you can expect great deals on clothes, bags and shoes along with local stalls selling frog legs, oyster omlette, bubble tea, lemon jelly, almond milk and much more. It was the perfect first night in Taiwan! 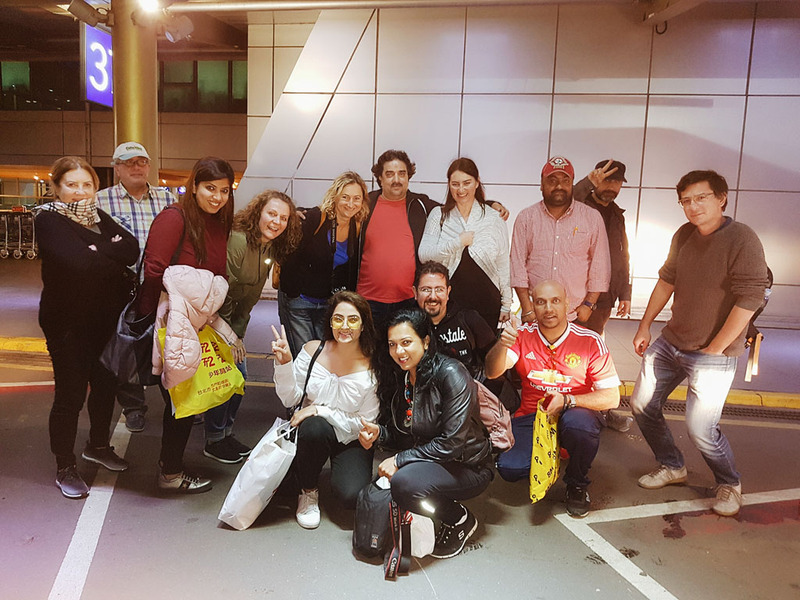 – We had transport arranged from the airport to the city but you can opt for a high speed train, cab or carpool. 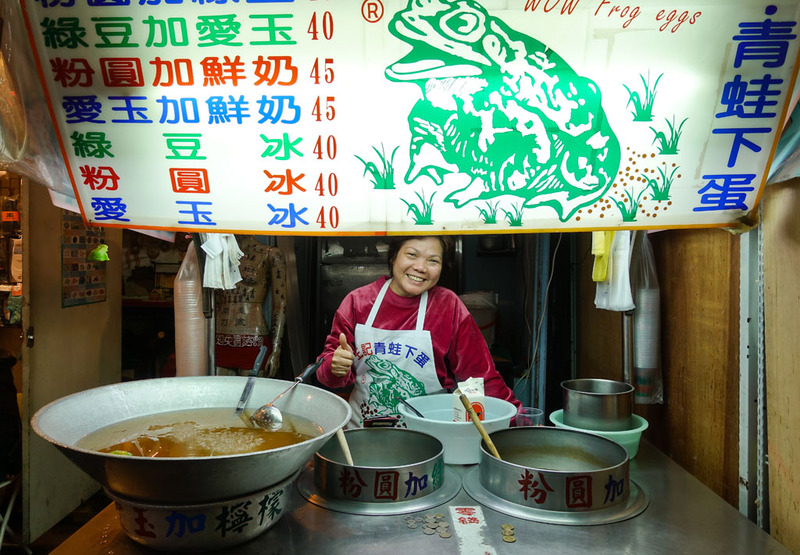 – There are plenty of night markets in Taiwan but Shilin is one of the biggest and most preferred by tourists. You can reach the place by metro (get off at Jiantan station) or cab. 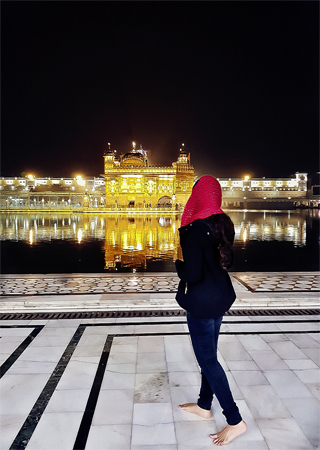 The best time to visit it is between 7pm to 12 midnight. There are some really amazing boutiques at the night market selling really chic outfits for a very good price. 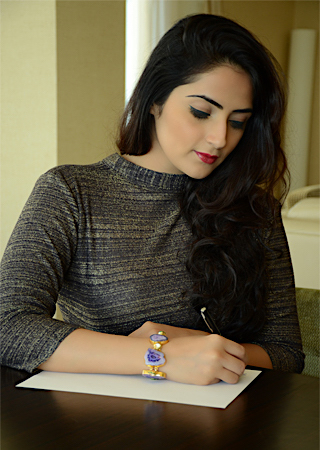 Do check out the store called Gusta. This morning my mood was as exciting as the itinerary for the day. 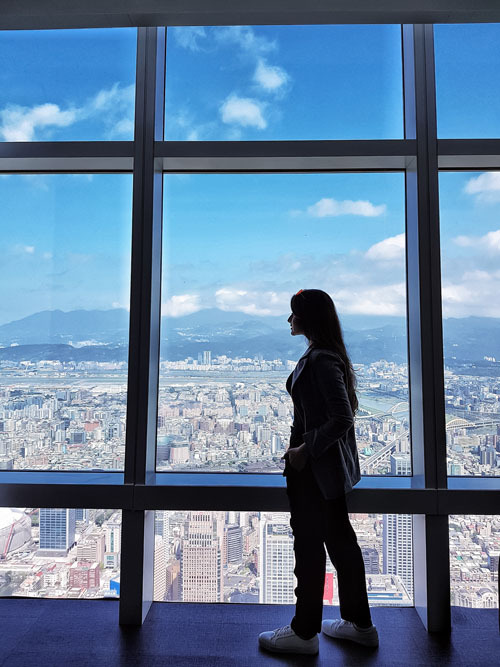 After a lavish breakfast at Grand Hyatt Taipei, we stepped out to explore the city. 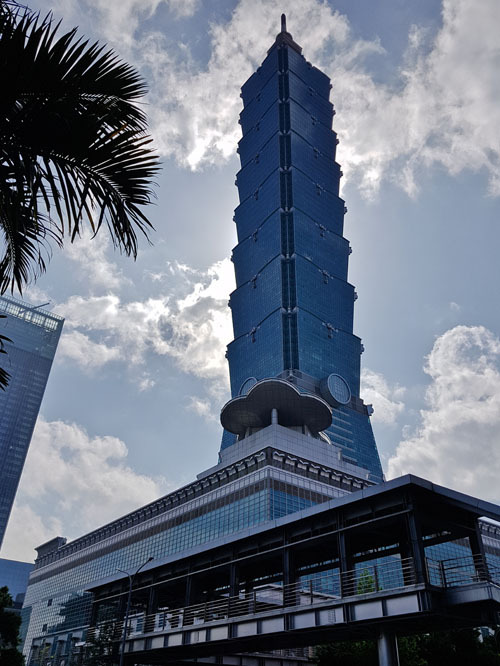 Just like every other tourist in Taiwan, our first stop was the famous Taipei 101 Tower, formerly known as the Taipei financial centre which was once the tallest building in the world. Soaring high, this iconic structure stands tall at 101 floors and is the perfect blend of technology, architecture and Asian tradition. 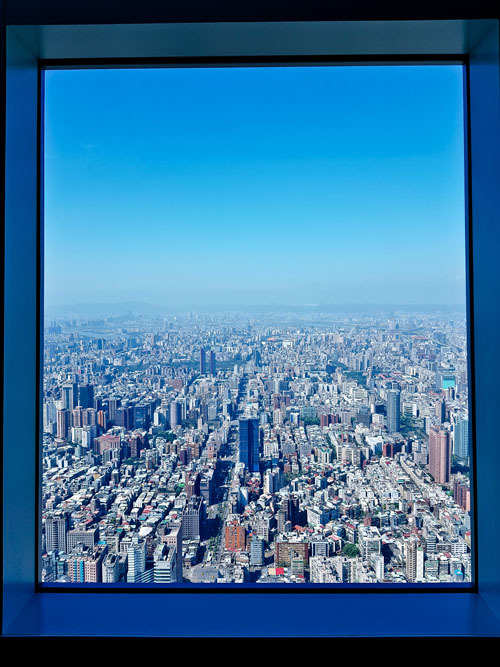 Our tour started with a trip to the observatory on the 89th and the 91st floors. 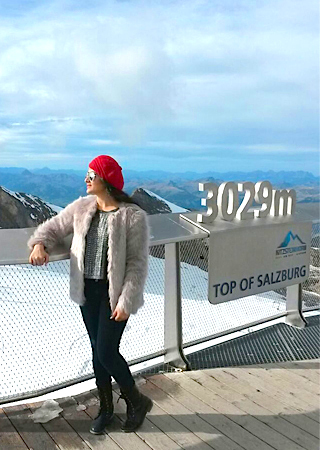 The expanse of the view from that height was a sight to behold and it indeed still stays fresh behind my eyes. 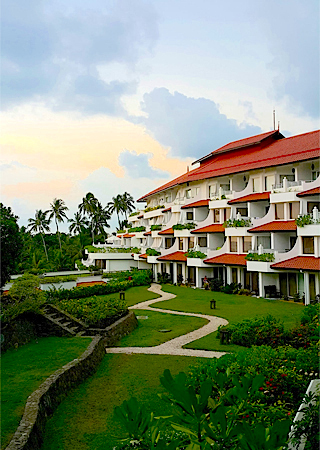 The experience makes one aware of the diversity of this island and most importantly it’s astounding architecture. A few hours and a zillion pictures later, we finally headed for lunch at a local restaurant. 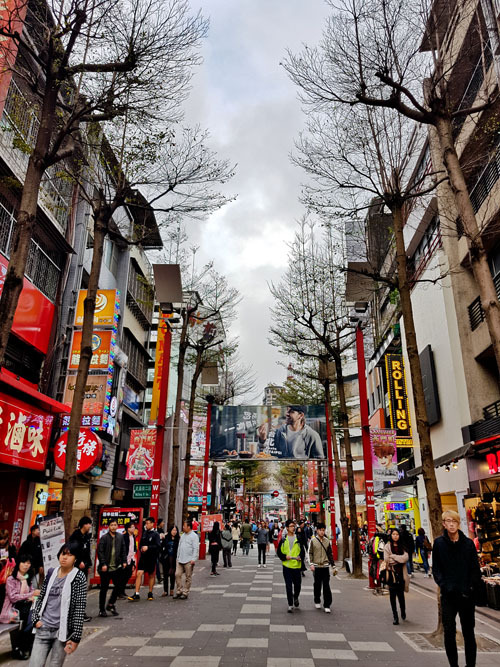 We spent the afternoon walking around the bustling Taipei streets, quaint coffee shops, artistic walls, interesting architecture, beautiful temples and friendly locals. After this mini Taipei tour we headed to the MRT station. The most exciting part of the itinerary was the high speed bullet train to Chiayi. It was by far one of the most convenient, economical and the quickest way to commute from the North to the South of the country. 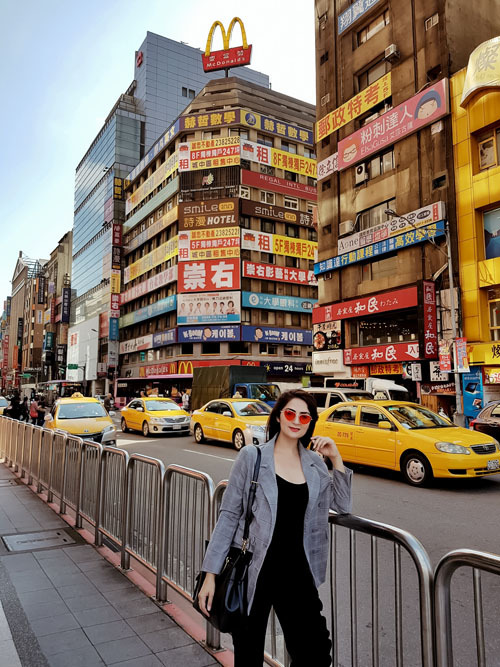 As we stepped foot in Chiayi, I was extremely excited to explore a new city. 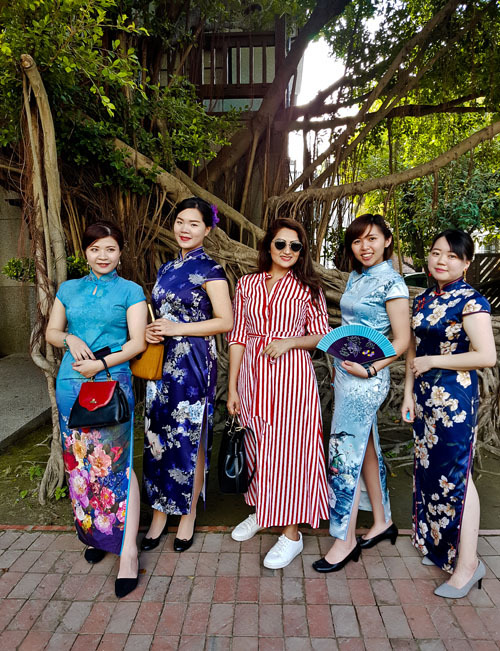 We checked in to Hotel Maison de Chine, settled in one of their wonderful rooms and slept with the anticipation to dive into this town’s culture and witness a fun festival the next day. 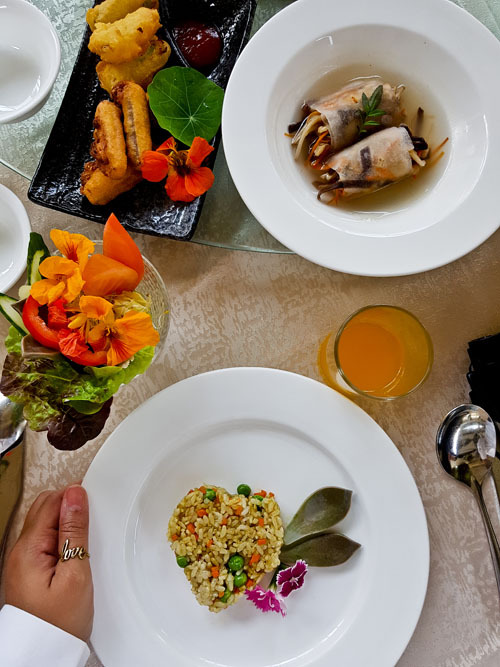 – The buffet breakfast at Grand Hyatt Taipei was so extensive with a wide variety of local and international delights along with so many live stations. 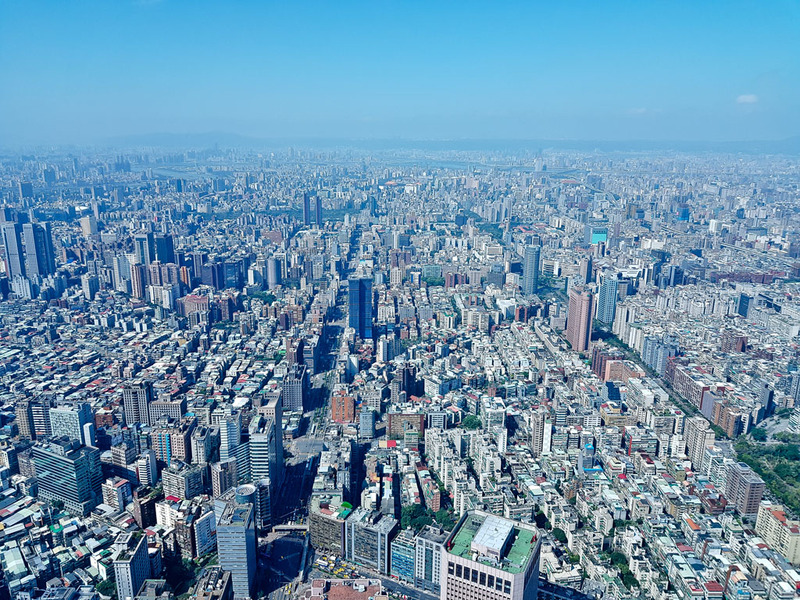 – When in Taipei spend atleast 3 -4 nights to explore this vibrant city. 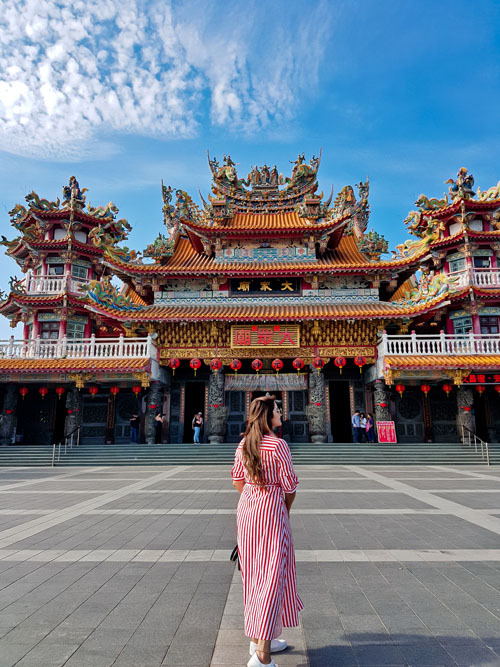 Make sure to visit the Taipei 101, night markets, beautiful museums and temples, local cafes and shop some regional brands. There are tons of day trips that you can take from Taipei. – The HSR bullet train takes around two hours from Taipei to Chiayi. The seats are allotted in advance and it’s extremely comfortable with a lot of leg room. The train has a washroom and also they sell tea/coffee/water. 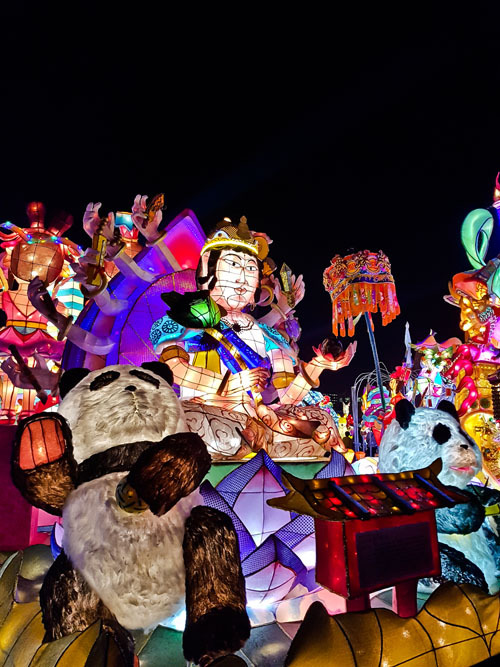 One of the main reasons for us to visit Taiwan was the famous Lantern Festival, an annual attraction hosted by the Tourism Board. 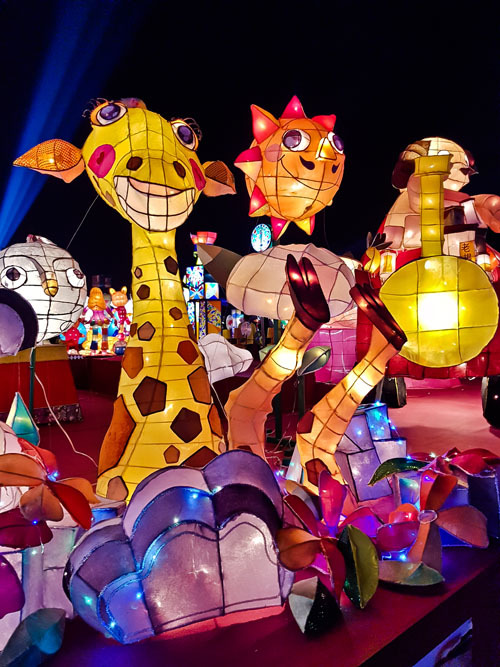 We were so excited to experience this spectacular display of paper lanterns (not sky lanterns) in all possible characters, shapes and sizes. We started our day with the International Press Conference for the Lantern Festival which was followed by a trip to the Southern branch of the National Palace Museum. 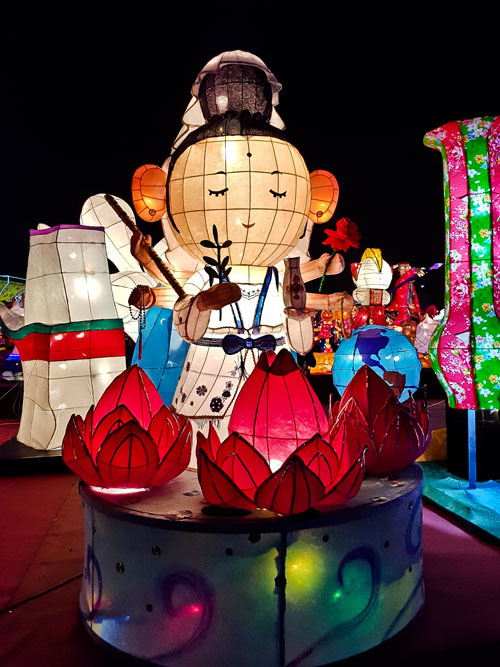 We reached the lantern festival site at around 7 pm and as we entered all I could see were happy faces, sparkling lights and a perfect blend of creativity and tradition. 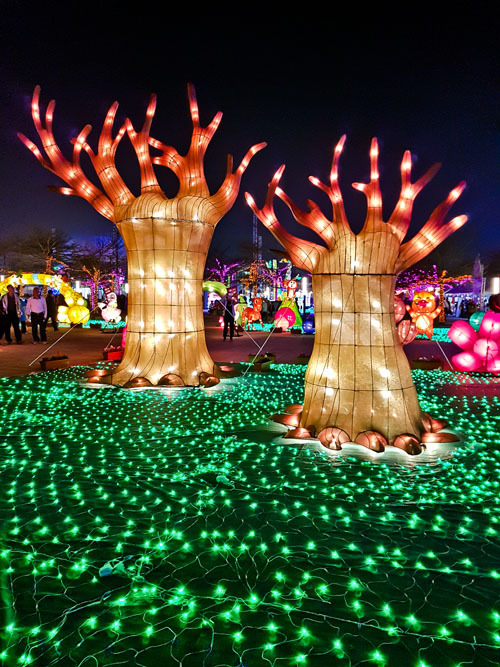 The entire place was lit up with artistic lanterns and was gleaming. The few hours I spent there were simply surreal. After a great traditional meal of noodles and veggies, we spent the night at Hotel Nice Prince in Chiayi. 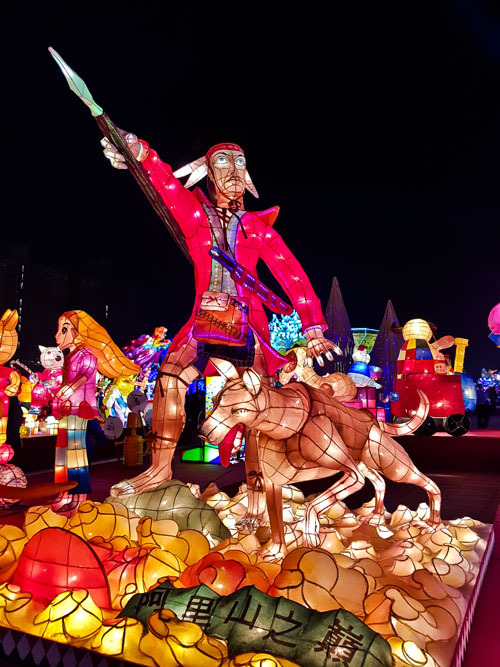 -This festival is different from the Pingxi Lantern Festival which is famous for it’s sky lanterns and that is something I would love to attend the next time I visit Taiwan. We began our day a little early and headed to Tainan which is further south of Chiayi. 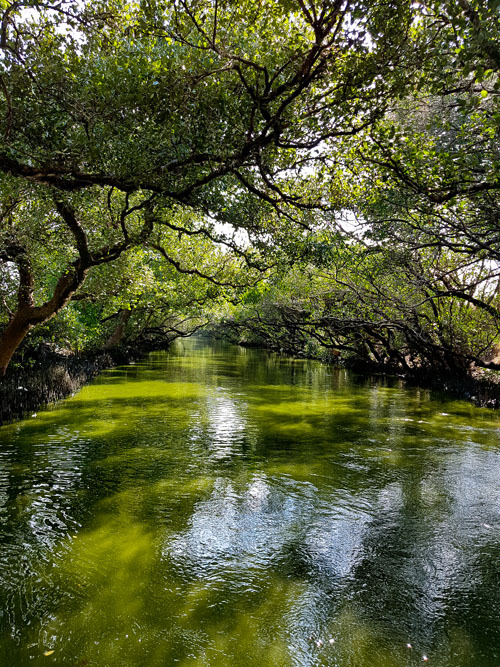 The plan was to explore the area in and around the Taijiang National Park. 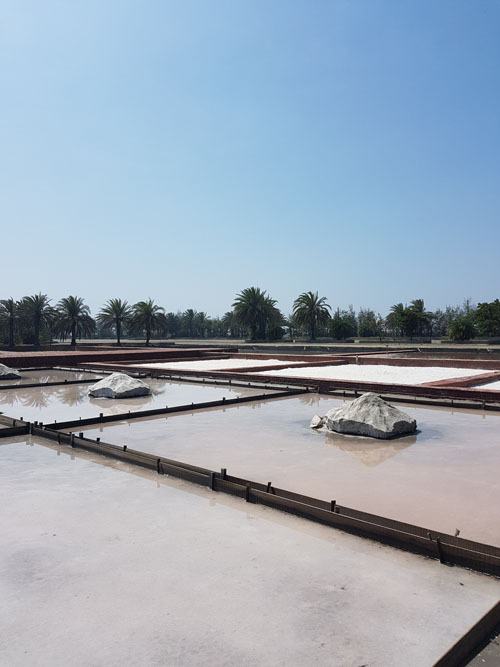 Our first stop was the Cigu Salt Mountain area where we learnt about the original way of extracting salt from the sea. It was such an educative experience and it got better when we took a tour of the entire place in a toy train. The field also has a little salt mountain which was once a large solar salt field. 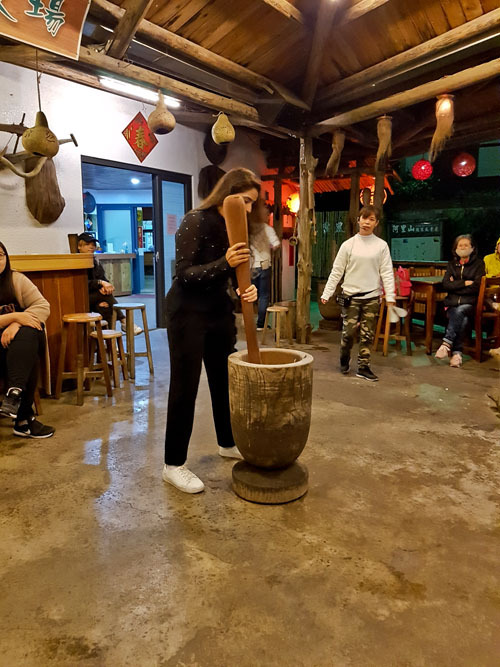 This tour was then followed by a delicious meal at Hotel Wei Yat Grand. I totally relished my colourful veggie hotpot along with fried rice and a spicy sauce, definitely a meal to remember. The next plan in the itinerary was my favourite. 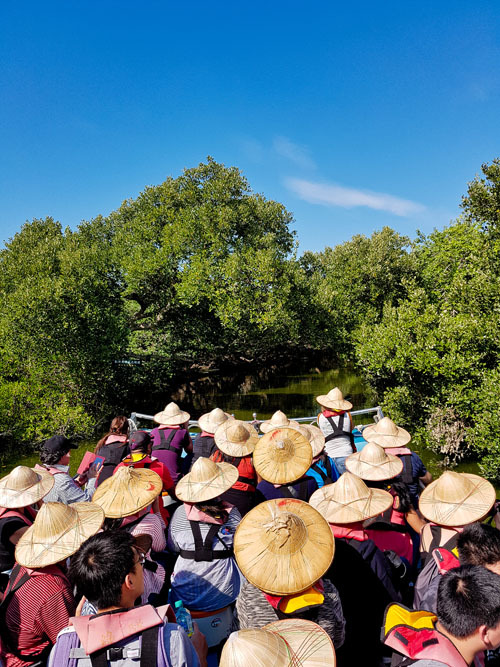 We were heading to the Sicao Mangrove Preserve, Taiwan’s very own mini Amazon rainforest. While we were standing in queue to hop on the boat, my heart was racing with excitement. I took the last seat and sat with a bunch of locals making my Taiwanese experience even more real. As the boat glided through the water my heart was full of gratitude, I was so thrilled and happy because the experience was surreal – Imagine a beautiful green passage with an unending dense mangrove forest which had a crystal clear reflection in the water, a cloudy blue sky, a sight of all the Taiwanese straw hats that everyone was wearing, a local guide showing around little crabs and mudskippers, all of this accompanied by the sound of the nearby temple bells. 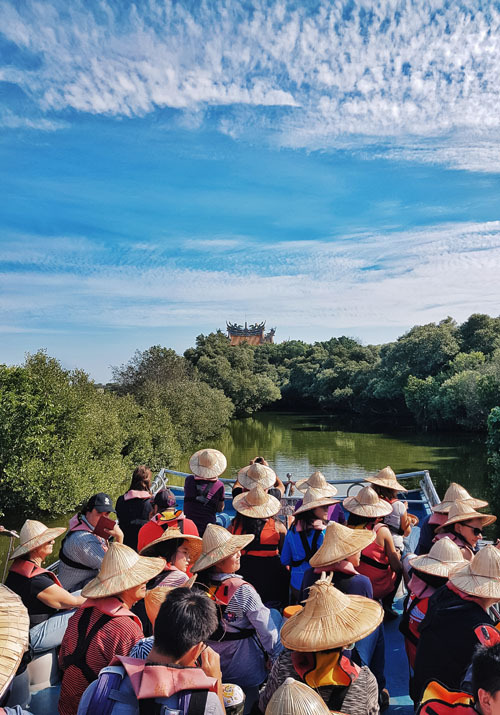 After that wonderful 30 min boat ride in the green tunnel as we were hopping on the bus we crossed the beautiful Sicao Dazhong Temple, a sight to admire. 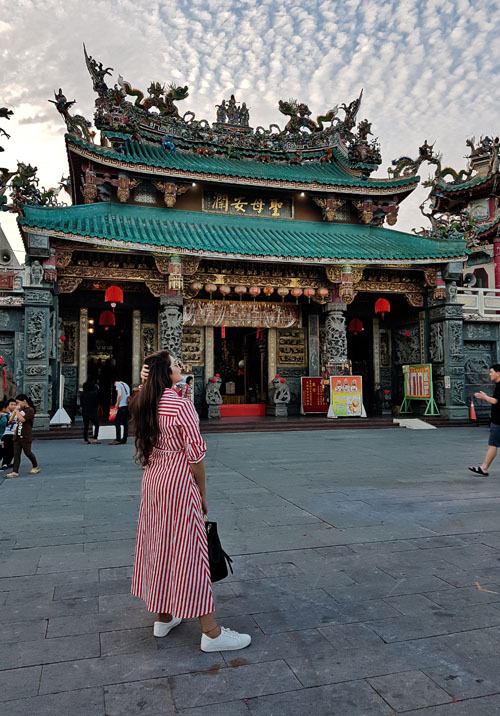 We spent that evening exploring the Anping district, saw Zhu Yuying’s former residence followed by a fun stroll in a local market where we tried some local fruits and bubble tea. Later we walked to the Tree House, Tianhou Temple and the beautiful Anping Old Fort. 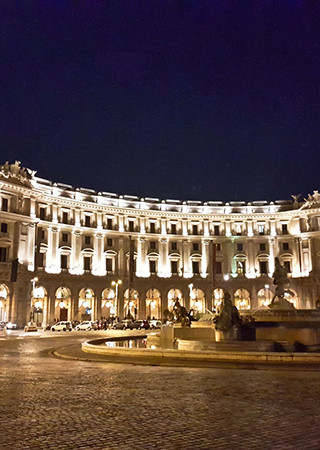 We ended the night at Hotel Silks Place, a grand luxurious property with an adjoining departmental store. My room was huge with modern interiors and faced the pool. Our dinner, just like the hotel, was so fine. 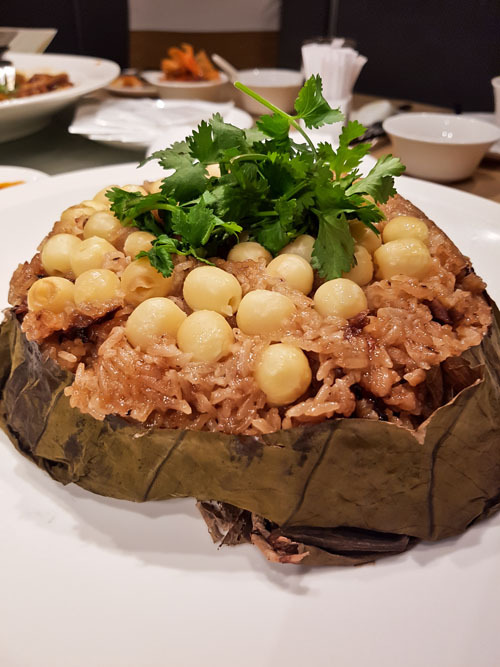 We feasted on some local delicacies like sticky rice with lotus seeds, sweet potatoes and bamboo soup served with authentic flavours and a fulfilling taste, the restaurant at Silks Place is something I highly recommend. 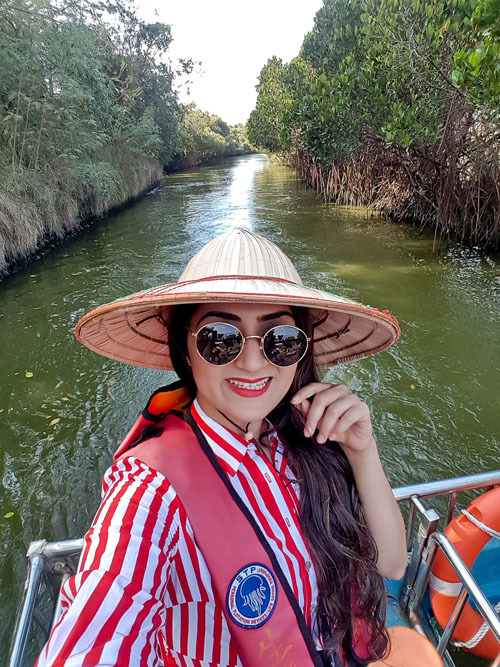 -This 30 min boat ride in the Sicao Green Tunnel is an absolute must do and a true Taiwanese experience. – All the places in the itinerary above were a part of the Taijiang National Park. 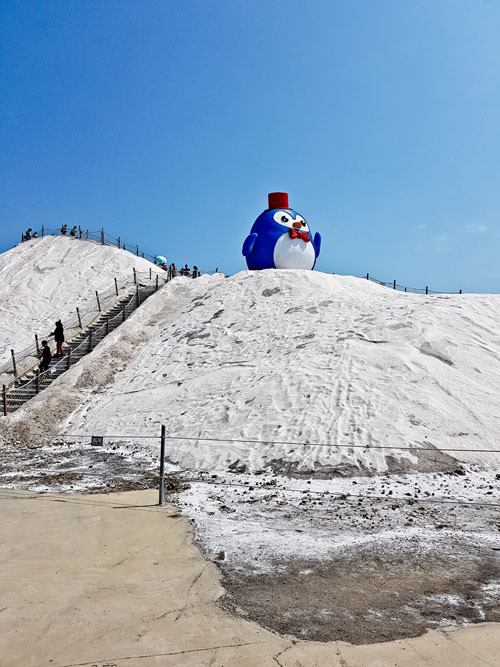 – The Cigu Salt mountain is more like a little pile of salt. 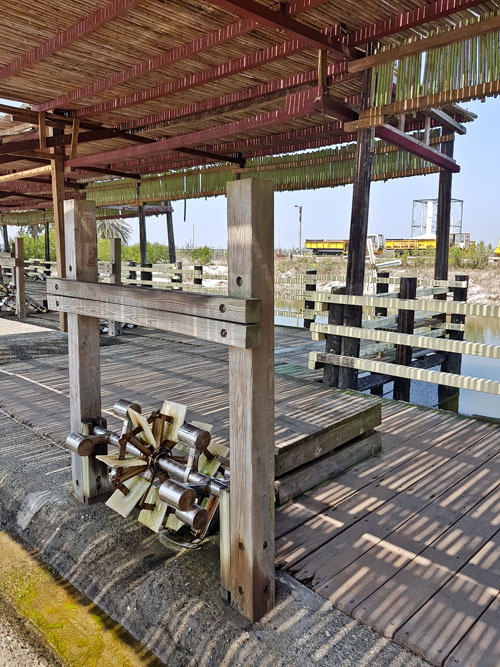 I would recommend a visit only if you are interested in learning about the salt extraction process. 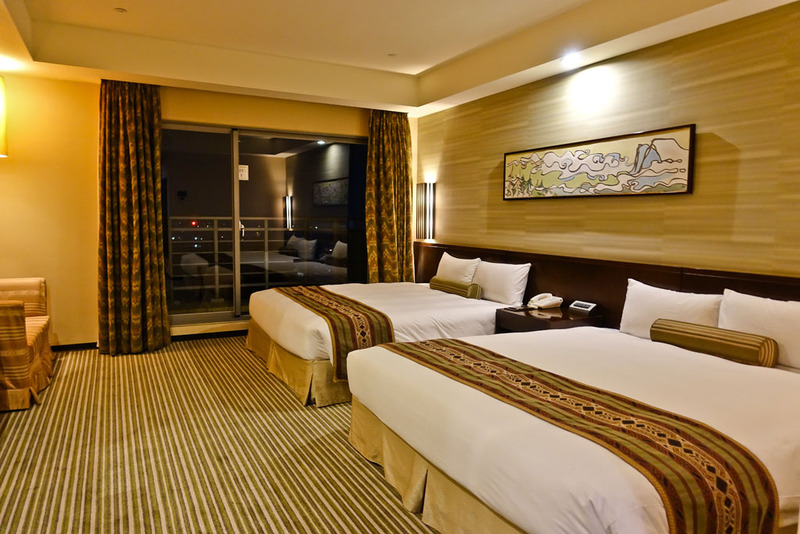 – I would really recommend Hotel Silks Place in Tainan. 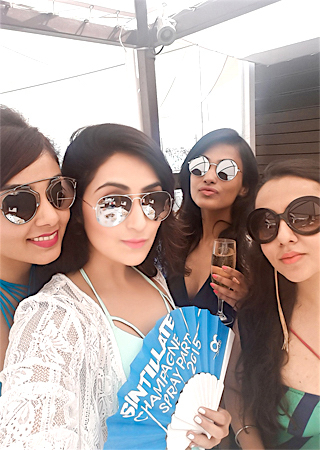 From the luxurious rooms, restaurant to service and the location, it was all impeccable. 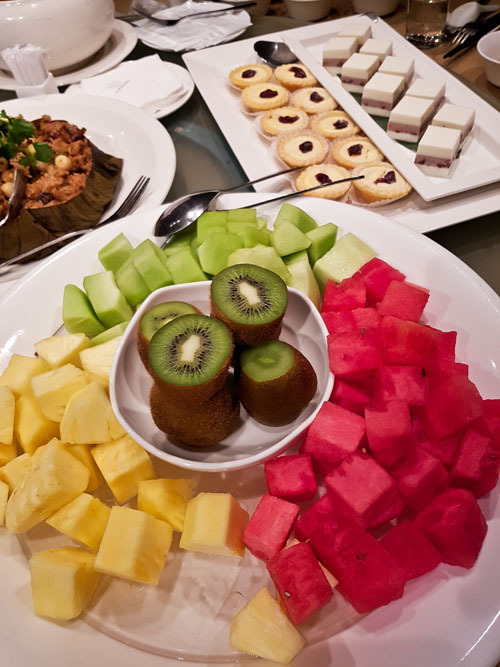 The breakfast in Hotel Silks Place was every food lover’s fantasy. It was spread across three floors – one dedicated solely to Taiwan’s local meal, one for Halal and one for Continental breakfast. After this appetizing start to the day we hopped on to our bus and headed to the Alishan Mountains, a huge contrast from the busy city life. Just the thought of being in a mountain range with the Taiwanese tribals was so thrilling. It was a three hour drive from Tainan and our eyes were treated to bamboo trees and cherry blossoms as we drove uphill. 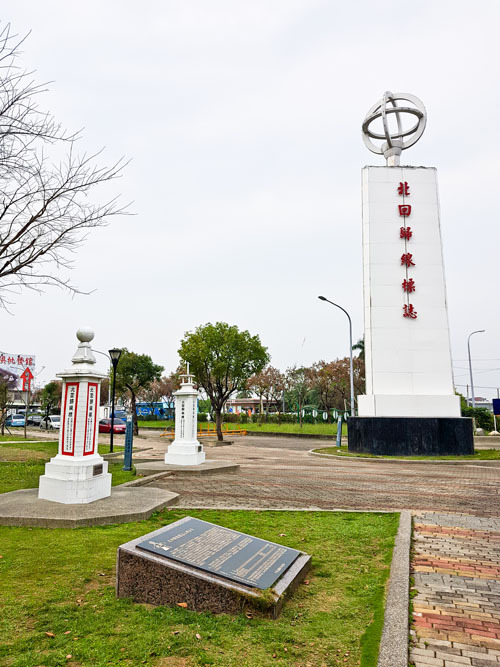 But before that we made a quick stop at the Tropic of Cancer that cuts through Central Taiwan and divides the country into a tropical and sub-tropical zone. 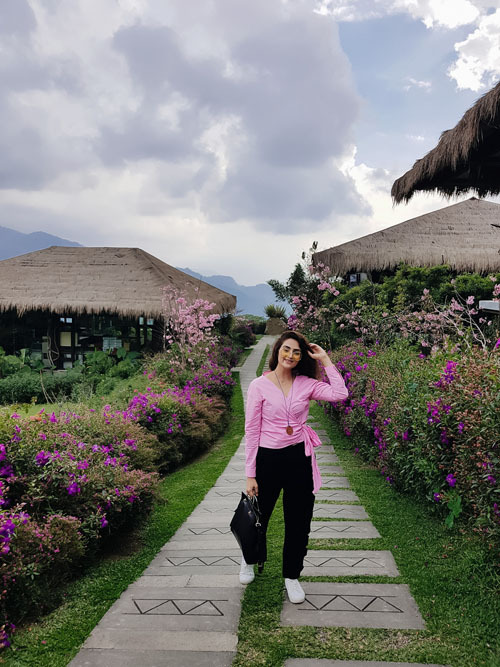 Known for its foggy mountains, low lying clouds, beautiful sunrises, bamboo groves, long deep valleys, tea plantations and the sakura falls at every turn, Alishan was as dreamy as I expected it to be! 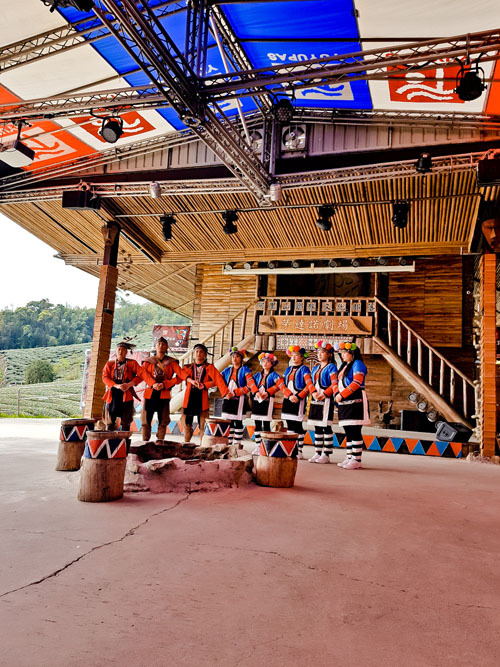 We first visited the Aboriginal Culture Village which is where the Taiwanese tribals come from. They welcomed us in their traditional fashion with a beautiful necklace and a little welcome song. 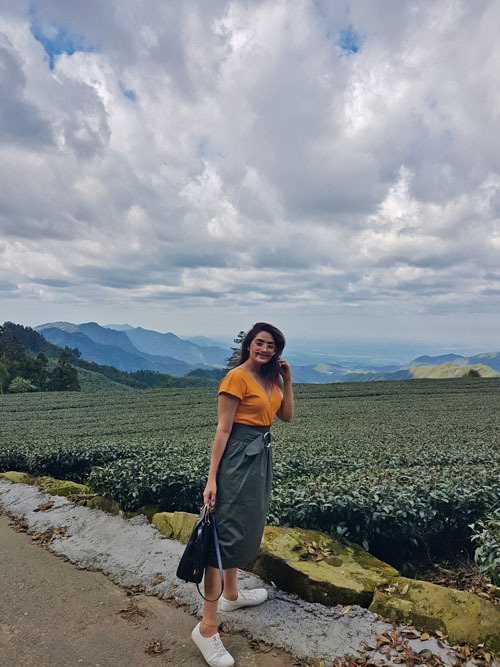 After indulging in the the indigenous specialities we explored the beautiful tea plantations and were smitten by their unreal scenic beauty and the little local village. 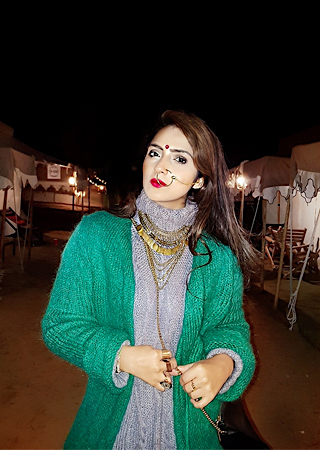 We were also scheduled to watch their local dance which enticed us in the middle of the soul-touching nature; their zest and amiability forced us to join in too! 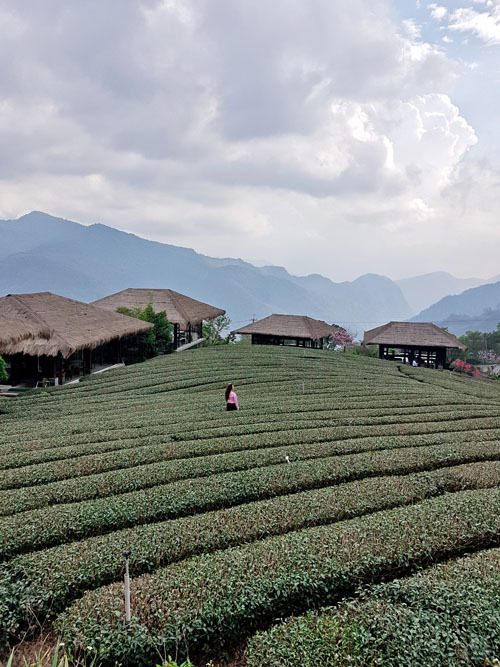 After spending a fabulous day in the Alishan Mountains, we headed to the Long Yun Leisure Farm, a small estate run by a family which was thirty minutes away. 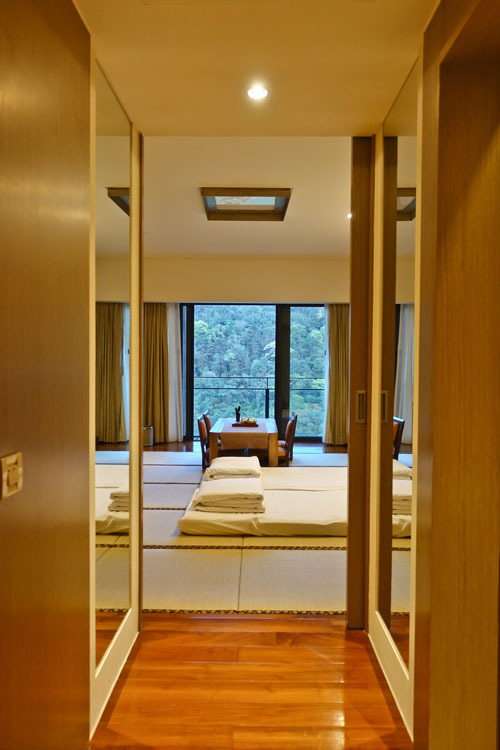 The property offered rooms and cottages wedged amongst mountains and picturesque forests. 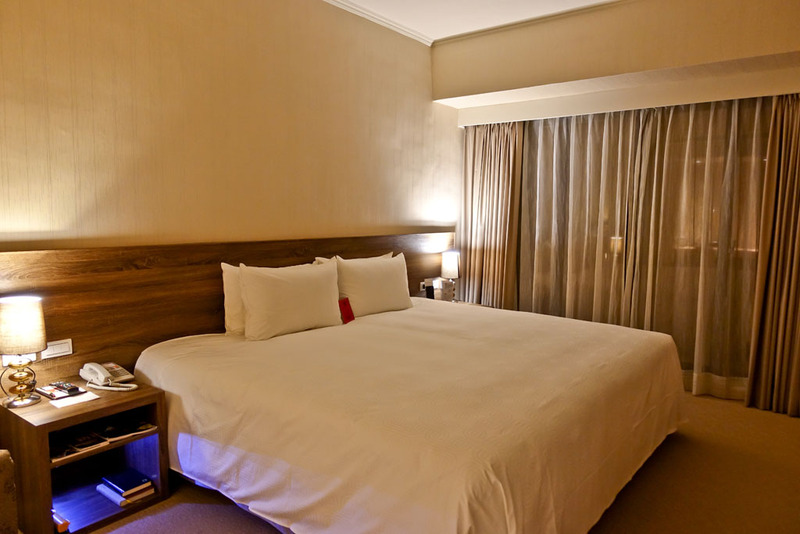 My room was comfortable, cozy and had that super homely feel. 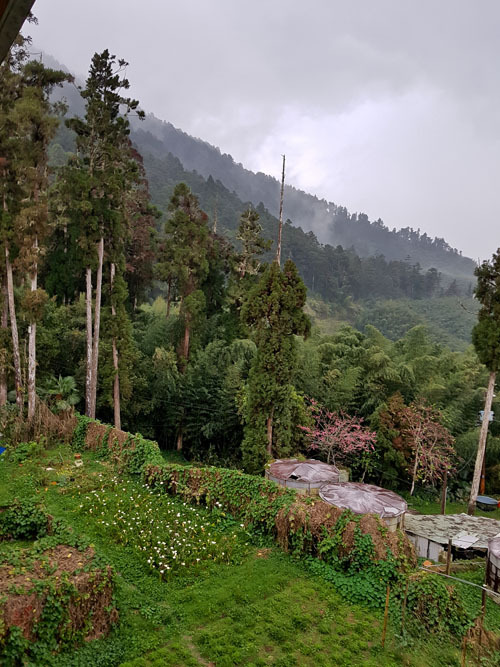 Moreover, we were welcomed with a beautiful thunderstorm that made for a perfect backdrop for an afternoon coffee session with my new friends. The itinerary that evening was something that I was totally looking forward to. We were scheduled to meet everyone at 7pm for a round of drinks and a mochi making workshop. 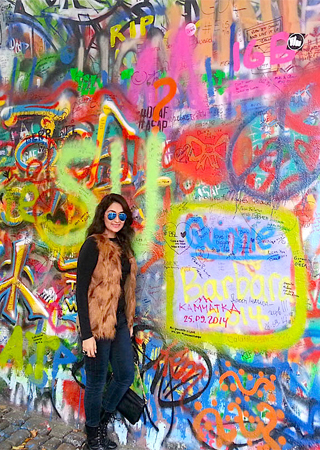 It was by far the most amazing and interesting activity in the entire trip. That evening was special, we laughed our hearts out, danced away and feasted on the famous Taiwanese mochi, a night I’m totally grateful for! 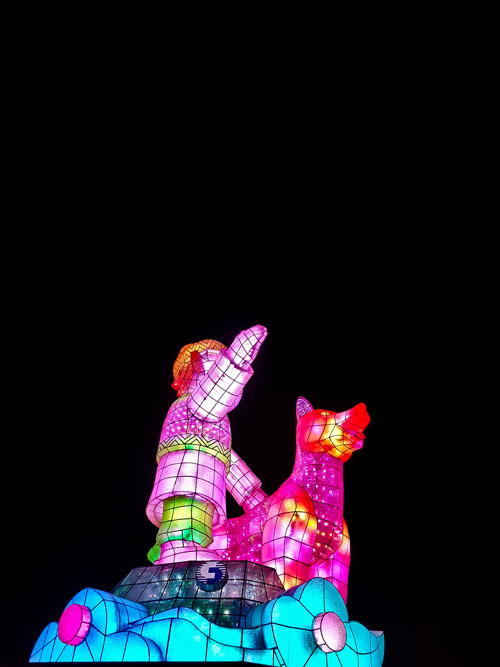 – Shan means mountain and Ali is the main attraction in the whole Alishan National Scenic Area. 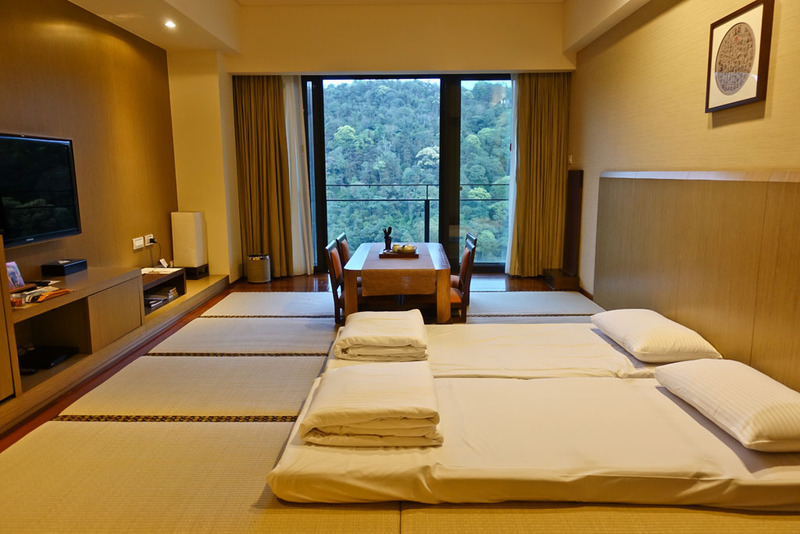 – I would highly recommend spending atleast 2- 3 nights in the Alishan Moutnain Range. It is absolutely beautiful. It’s also very famous for its early morning train ride to the top of the peak to catch the sunrise. 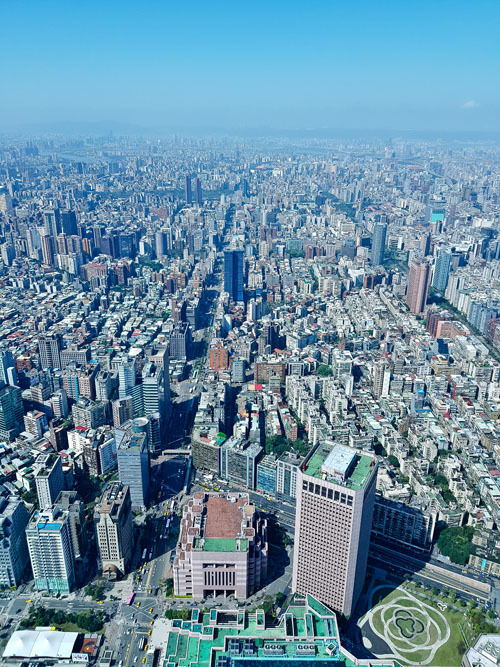 -Taiwan is known for leisure farms and it’s something you should experience. The Long Yun Leisure Farm was absolutely amazing. It is a small family run farm so definitely don’t expect luxury but yes it is comfortable in every way possible. You might have to pre-book or check about specific food requirements because of the limited availability. Luckily, for me vegetarian meals were available throughout. – YuYuPass is the cultural park we visited which was home to the aboriginals once upon a time. 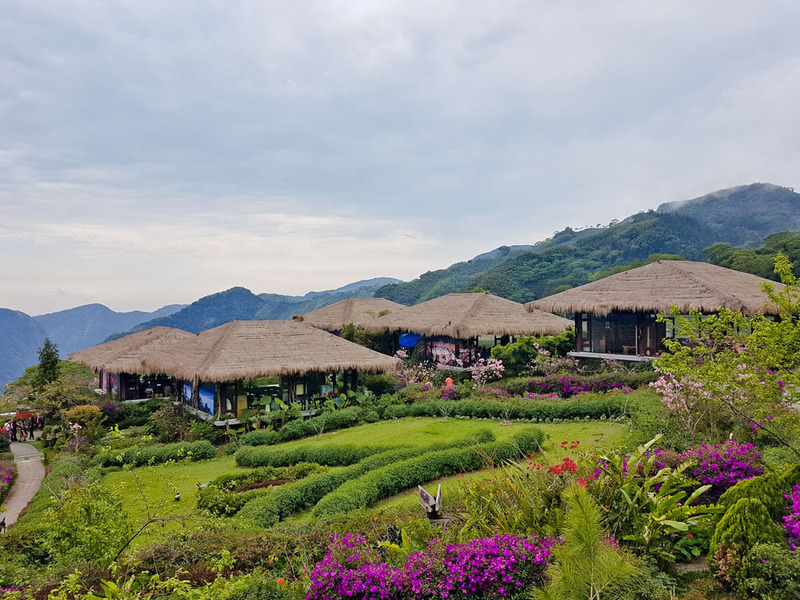 The park is located in the Alishan moutnains and has an exhibition hall, traditional houses, restaurant, a mini amphitheater and and tea plantations which makes it a great place for a half day trip. 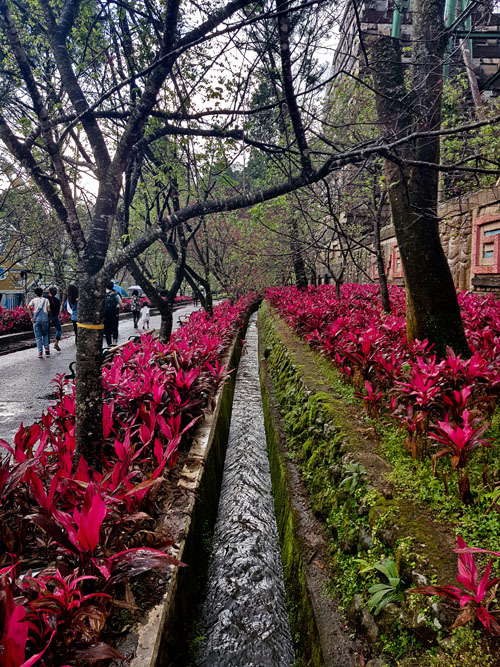 – The top things to do in Alishan would be the Forest Railway (so picturesque), Sacred Tree Route, Hiking, Shoujhen Temple, watching the sunrise (a must), send a wooden postcard home, drink Alishan tea/coffee. 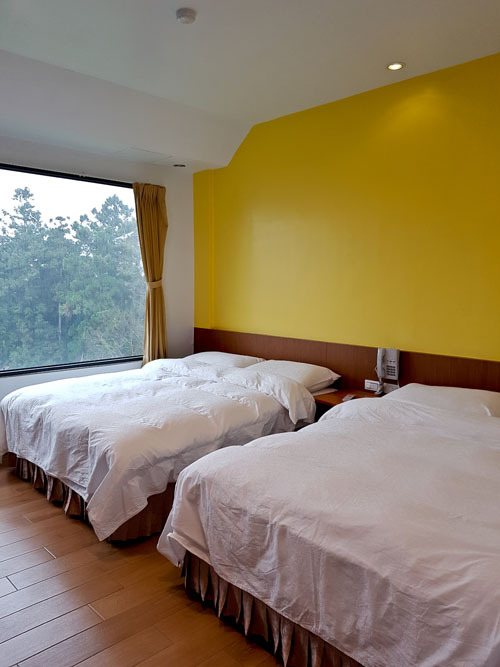 -The best way to reach Alishan is by taking a bus or cab from Chiayi city. This morning, I was smiling ear to ear as I woke up to a postcard view- blue skies, green trees and majestic mountains. We all decided to walk around and tour the farm before we leave Alishan. 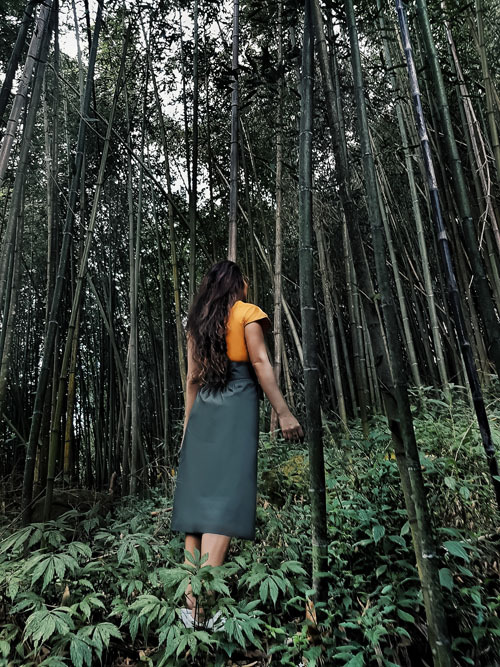 Not only did we explore so many tea plantations and cedar trees but also found a beautiful bamboo forest, a bucket list moment for me. After touring the entire farm we departed for the Sun Moon Lake. 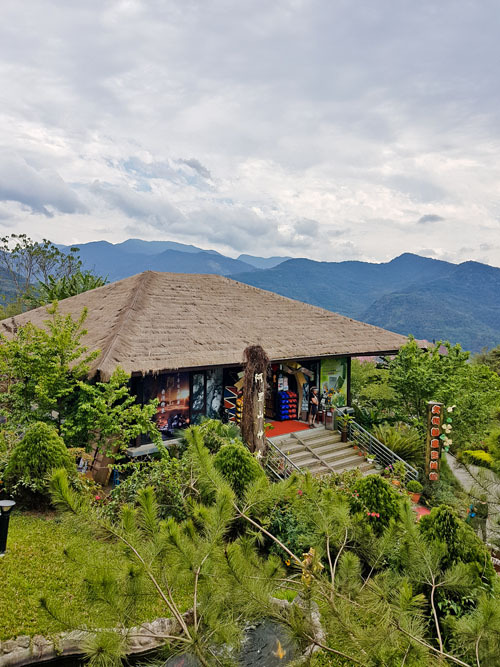 On the way to the lake, we stopped by the Formosan Aboriginal Village, a theme park and a culture experience. 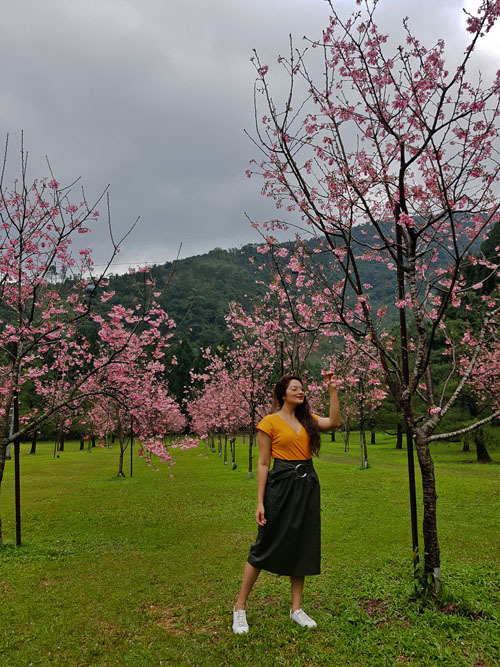 This is the best place to witness Taiwanese culture, lush forests, blooming fields of tulips, cherry blossoms and some crazy theme park rides. We spent the day gallivanting in the park, exploring the ancient local houses, learning about the aboriginal history, walking around the forest area. 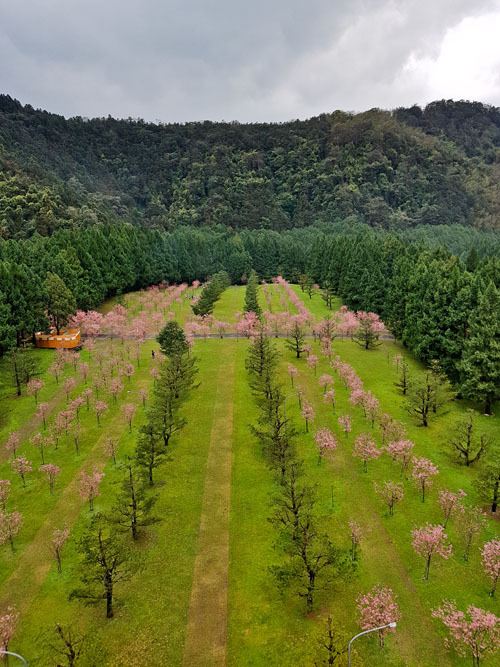 After the most breathtaking cable car ride, we got off at another area which was packed with the last bit of cherry blossoms. It was the end of Sakura in Taiwan and we were so lucky to experience this. I couldn’t believe my eyes, this was a dream come true. While leaving we made a quick stop at the souvenir store, tried some cherry wine and bought some delicious mochi. 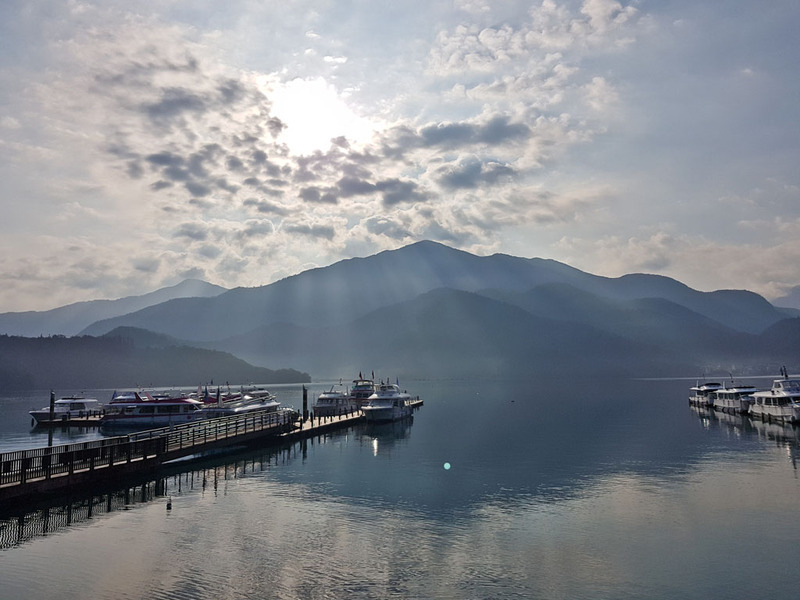 It was time to leave for the Sun Moon Lake and I couldn’t be more excited. As I got out of the bus all I could picture was the resemblance of this place to that of Lake Brienz in Switzerland. I was totally floored by it’s beauty, a far cry from what I had imagined Taiwan to be. This sight definitely made it to the top of my list and one of the biggest reasons for me to come back to this island. 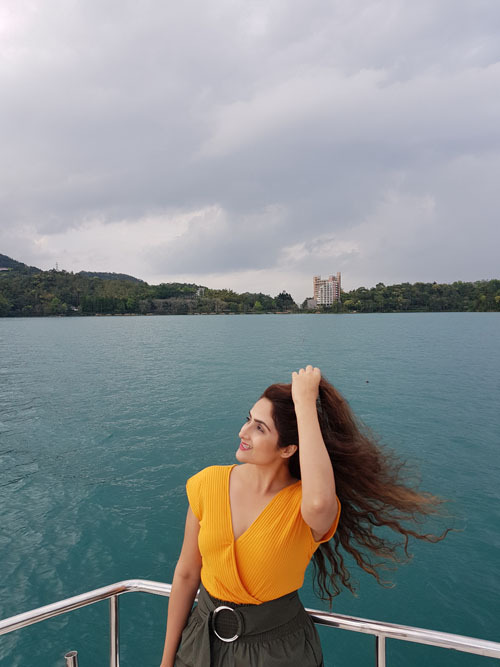 Our 60 min boat ride in the Sun Moon Lake was absolutely phenomenal. 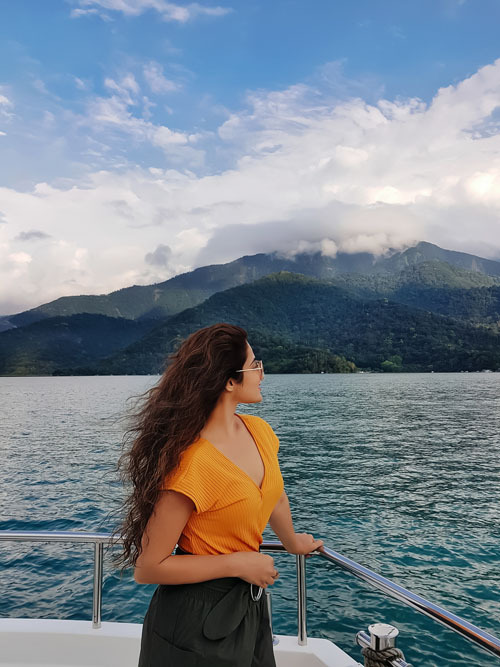 As we cruised through the glistening turquoise waters, the clouds drooped low complementing the several layers of majestic mountains just like colours squirming right out of an artist’s palette. As the gentle breeze blew through my hair, the world had come to a standstill, time had frozen and I felt like I was living in a painting. It was the islands’ most lovely natural vista. 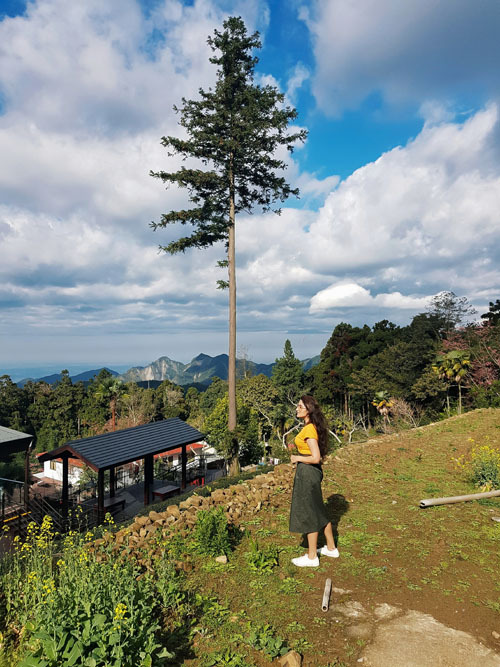 Sitting at an altitude of 762 m in the Nantou County, this piece of paradise is the hidden gem of Taiwan. After the amazing boat ride we checked in to the uber luxurious lakeside property- Fleur De Chine. 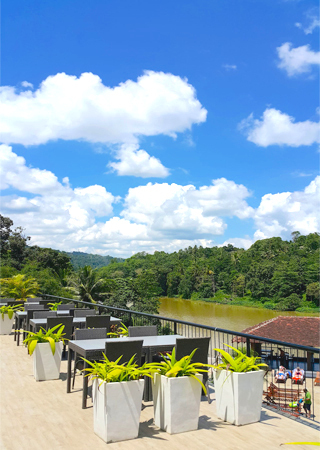 Complementing the natural surroundings, the hotel is built right on the lake. Having heard so much about their unique rooms and after watching the impressive hotel exterior and lobby I was literally gliding towards mine. As I opened the door, my jaws dropped! 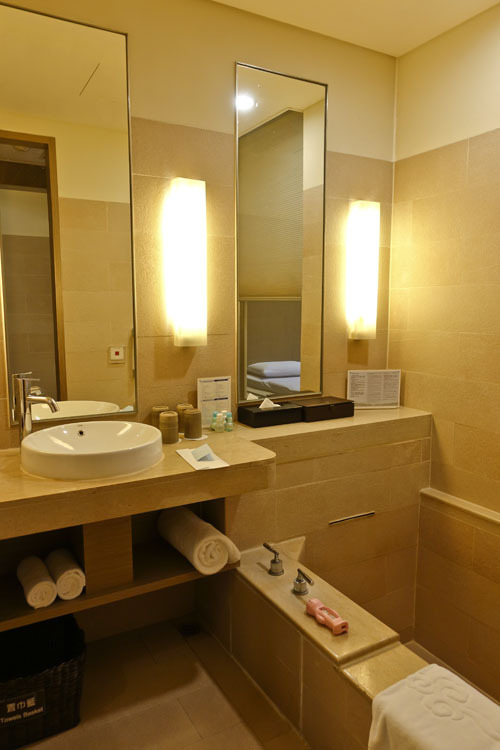 The room opened up to a little corridor which had a bathroom on one side and a toilet on the other. The bathroom came with a it’s very own marble hot spring tub and a thermometer. The wardrobe on the other side was stocked with cute kimonos and Japanese slippers. As I walked ahead I was led into a huge wooden floor room which had a tatami style bed (Japanese bed) on the floor. 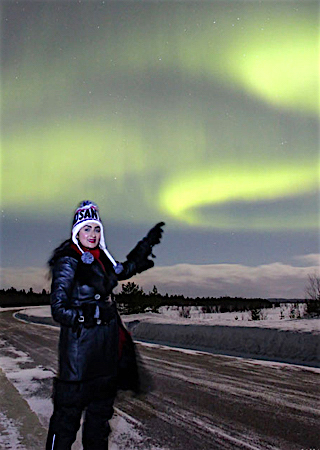 It was something I had never experienced before and I was thrilled beyond words. Alongside the bed was a low Japanese seating tea table. The room was well stocked with local snacks and all cool gadgets. Now here comes the highlight of the room- the terrace. 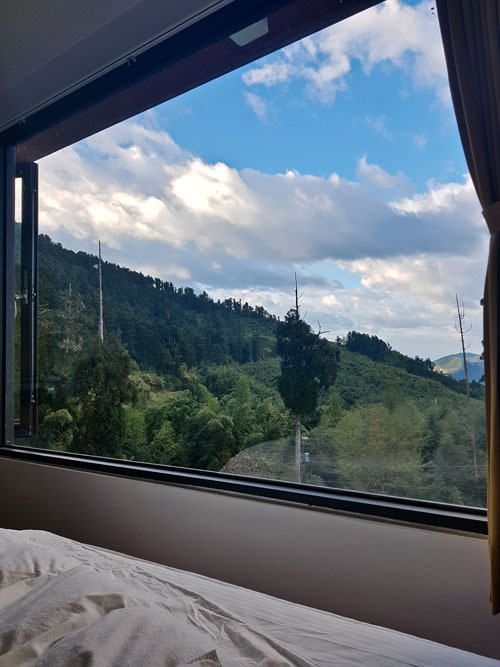 As I opened the sliding door I was welcomed to a never-ending silhouette of the mountains seemingly emerging from the calm serene emerald blue lake. It was like living a dream. I made myself a nice cup of Japanese tea and spent an hour staring at that beautiful sight literally counting my blessings that day! After a delicious buffet spread and some jazz we called it a night. -The best way to reach the Formosan Aboriginal Village is either by road or by the cable car from the Sun Moon Lake. This is also one of the best spots to experience the cherry blossom. It’s a treat for all age groups. 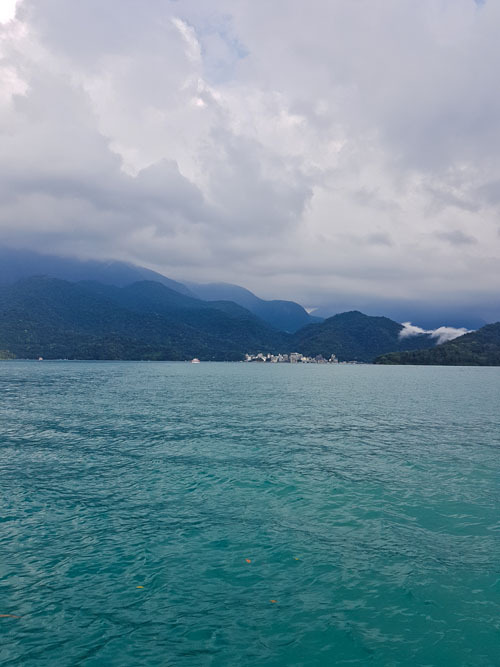 -The cable car ride from the Sun Moon Lake to Formosan is supposed to be very scenic. Unfortunately we did not get a chance to try it all the way but I would highly recommend you to do so. 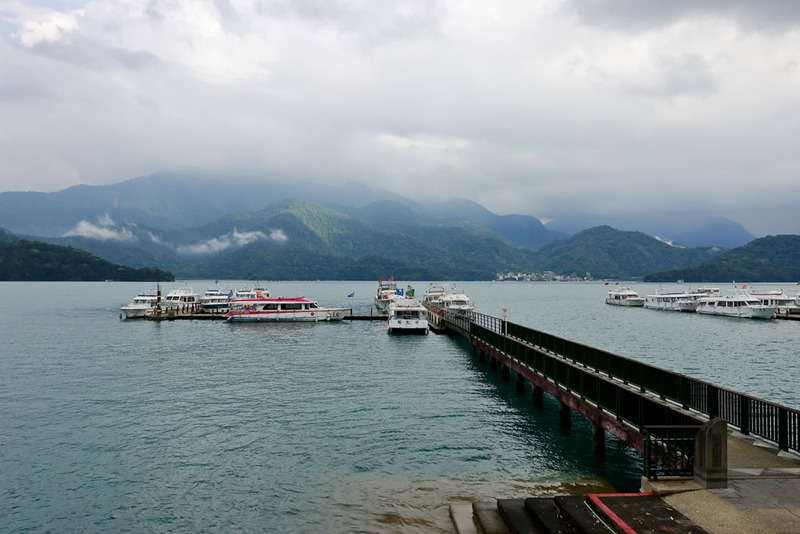 -You should spend atleast 3 nights in the Sun Moon Lake area. It is absolutely beautiful and has so many activities. 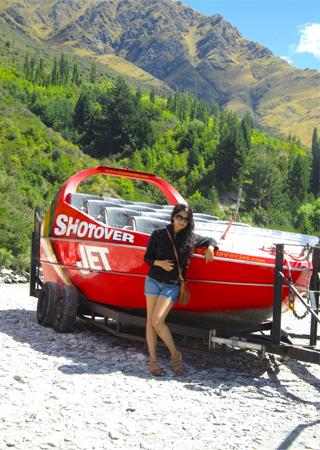 The boat ride in the lake is a must do. 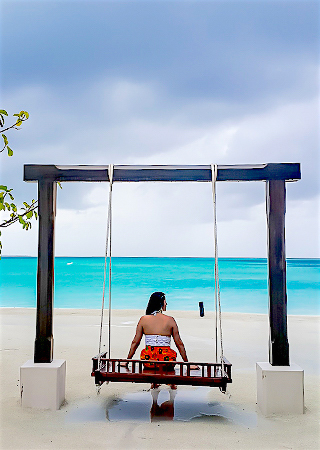 I would recommend you to take a longer ride and explore the Lalu and Ita Thao island. 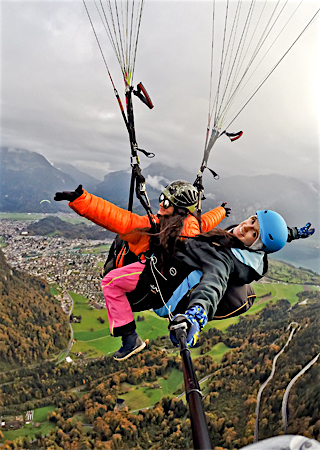 -You can go paragliding, relax by the lake, cycle along the shoreline, visit the Wen Wu Temple, take the cable car ride, hire a boat and cruise around. The area has tons of hotel options around the lake. -Fleur de Chine was definitely one of the highlights for me on this trip. 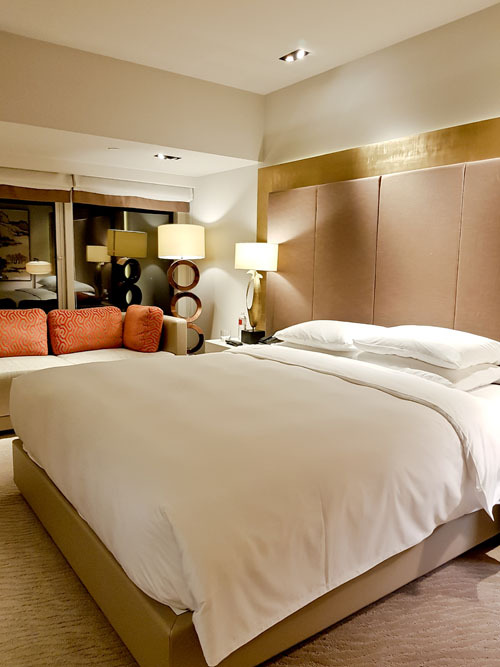 The hotel boasts six restaurants including a beautiful rooftop bar, a gym, indoor gaming zone, Shiseido Salon and Spa, a rock climbing wall, gift shops and a recreational Water World. As I sipped my morning coffee with that gorgeous mountain view all I could think was what a beautiful world we live in. 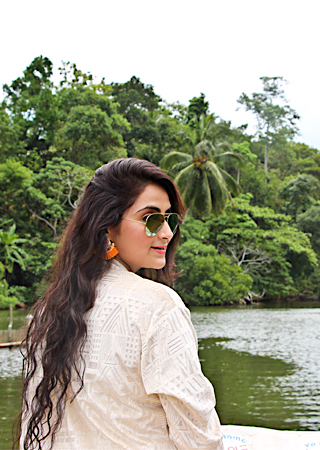 The scent of fresh air and the colour of the green trees was daunting along with the reflection of the mountains in the blue water and the mist lingering on the wooden bar was just adding to the mood of the calm and serene paradise. Since I wanted to make the most of my last day, I got ready and rushed to the reception to hire a bike and cycle around the lake area. The dedicated bike path was a big incentive. As I reached the pier, I saw the sun rise between the mountains and the entire water was gleaming with it’s rays. 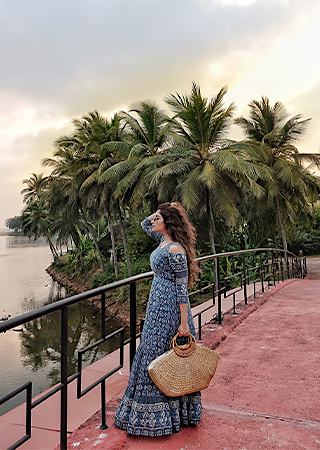 It was a delight to experience this magical hour, hear the chirping of the birds, watch the clouds drift slowly as the smooth breeze formed ripples over the misty surface of the lake, a moment so surreal! After breakfast we headed to the Tai Yi Red Maple Resort for a fruit picking session. On arriving to this leisure farm in Puli we were welcomed with a big smile and a tour of the place. Since it’s an ecological farm they also have beautiful cottages in natural surroundings and a hotel to stay in. 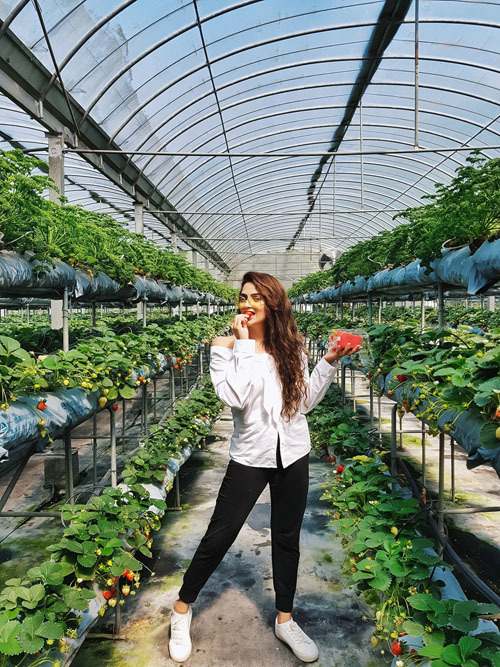 I was super excited to pick strawberries. As we walked towards the greenhouse we were handed a small empty box and a scissor and knew we were all in for a treat. A few chop chops and an overflowing box later I forced myself out of the greenhouse and packed my fresh organic strawberries to take with me on the flight. The farm restaurant had arranged for an organic meal for the entire group. I loved indulging in those fresh ingredients which were prepared so well. I definitely couldn’t have asked for a better way to end this trip. 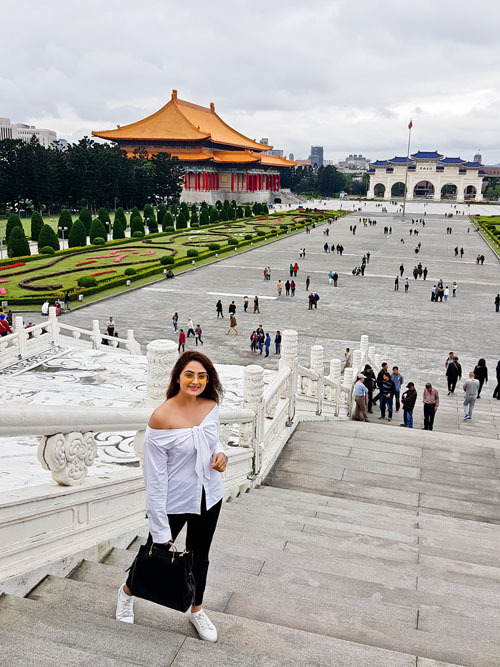 After that gluttonous moment we went to the Taichung station, caught the HSR(high speed railway) to Taipei and walked straight to the Chiang Kai Shek Memorial Hall, a huge commemorative monument and a prominent landmark in Taiwan. We were right on time to witness the amazing guard change ceremony post which we decided to split and indulge in some end moment shopping. A few hours later, with hands full of bags and a heart full of gratitude we boarded our bus and headed to the airport. 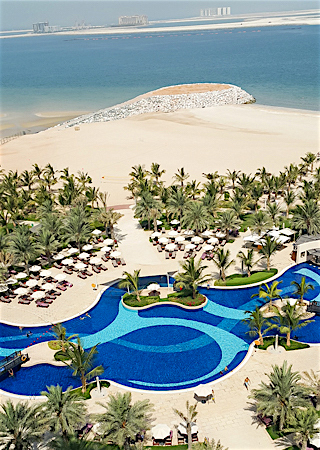 – I was extremely impressed with the hotel staff at Fleur de Chine. They was so kind they actually left me a bottle of water, napkin and the hotel card in my cycle basket incase I need it. It’s always the little things that matter the most. 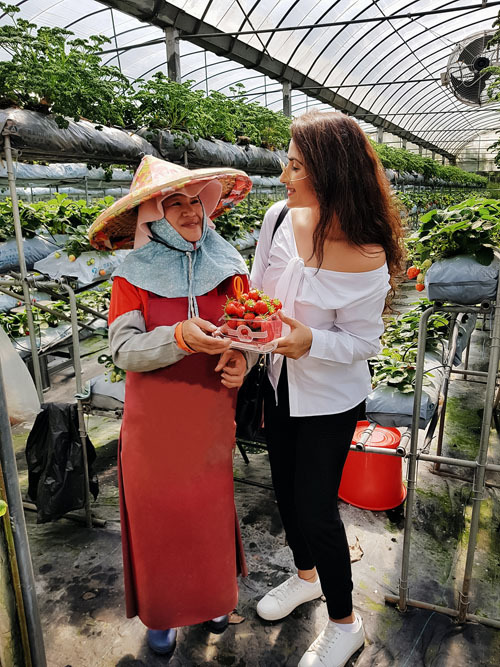 -There are tons of fruit farms in Taiwan but the one we visited was definitely amazing. 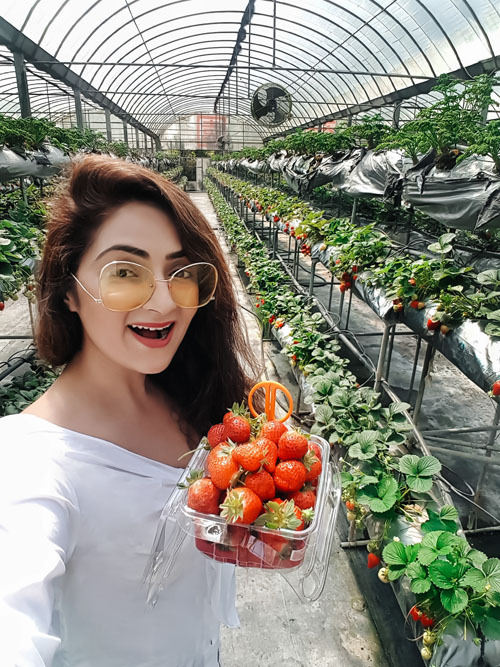 Even if you are not staying you can book a tour of the farm, pick strawberries and eat a fresh organic meal but do book it in advance. 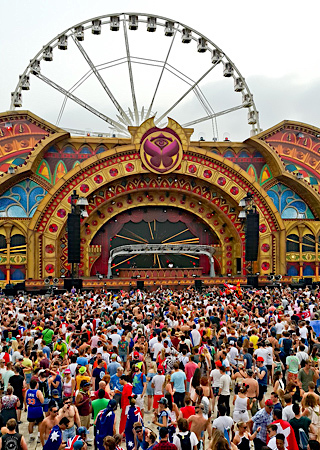 The seven days spent in this cultural kaleidoscope were beyond incredible. This island is a great blend of breathtaking panoramas, striking rich history, delicious food, warm people and undiscovered pieces of paradise. 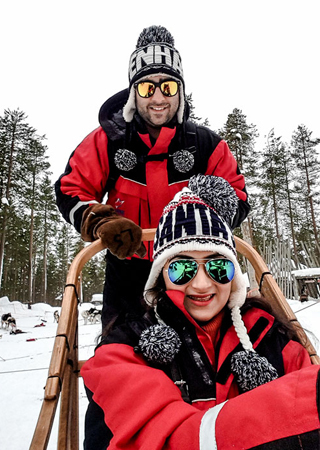 Your packing list totally depends on the weather you are travelling in. We went towards the end of February and it was quite pleasant, not hot not too cold. So for cities like Taipei and Chiayi I packed blazers, full sleeves tops, monochrome outfits and comfortable pants in 2-3 colours. 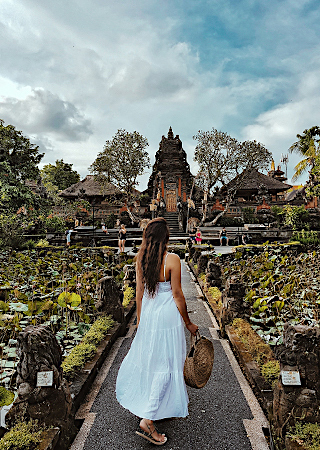 For smaller towns and and temple visits I packed long dresses and comfortable knee length skirts. Basically I suggest packing casual clothes that are super comfortable yet stylish. 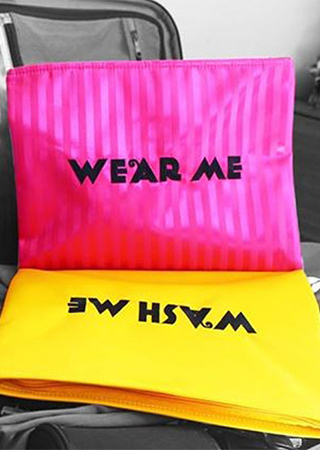 So fun printed/embellished t- shirts, off shoulder tops, printed dresses, a blazer incase it is chilly, monochrome outfits, good pants or trousers, shorts for the summer a medium size bag that you can carry all day long (big enough to fit all your stuff). Also throw in some funky accessories like coloured sunglasses. Avoid big chunky jewellery because it will be really uncomfortable to wear that while exploring. 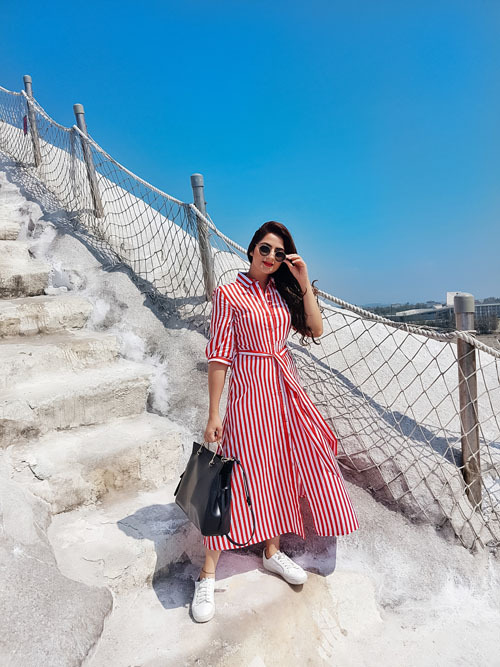 The summer is extremely hot and humid so pack shorts, loose dresses and hats. 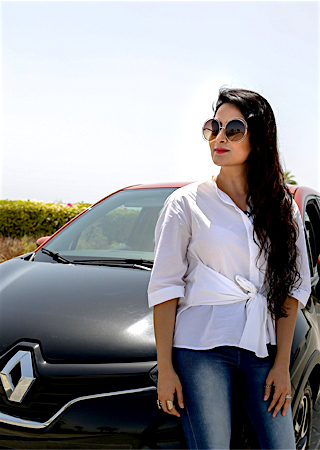 Overall the dressing style is extremely casual and comfortable. Make sure to pack a good pair of walking shoes because there are tons of hiking trails and everyone is always on the move. I only carried a pair of white sneakers which I could style with almost everything. – Buying the mochi cake and dried mango. 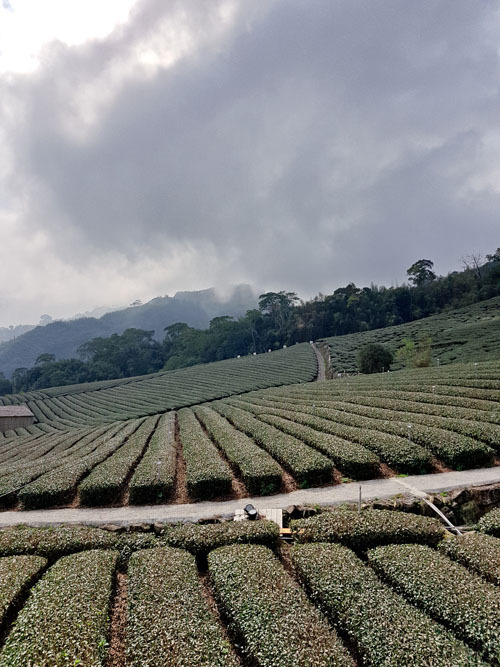 – Visiting the Alishan Mountain range. Also see the sunrise and bamboo forest if possible. 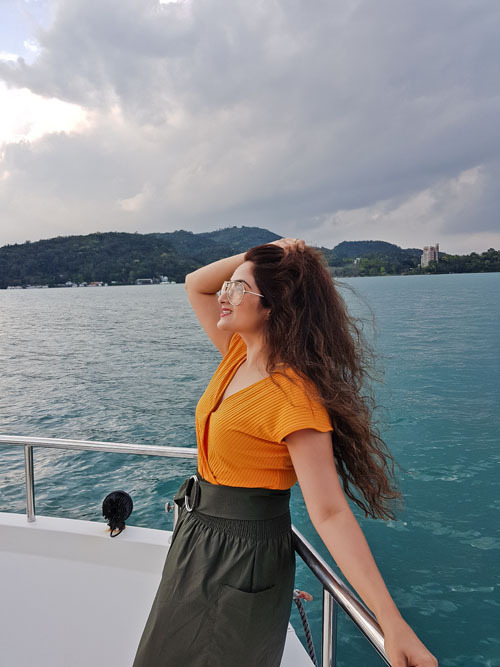 – Sailing in the Sun Moon Lake, it is so dreamy. 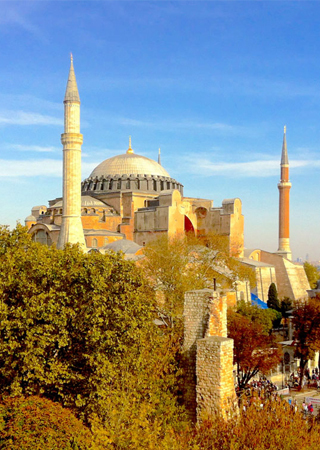 -There are tons of Halal restaurants and vegetarian food is available too. Rice, noodles, stir fry veggies, sweet potato and bamboo soup are some dishes that are easy to find. 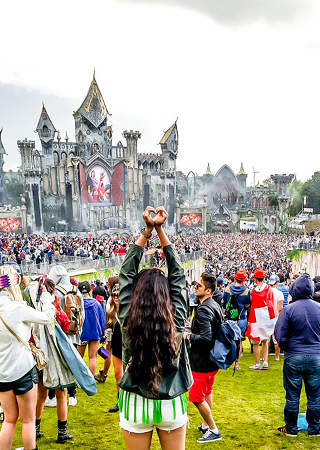 – Spend atleast three nights in every town for the best experience. 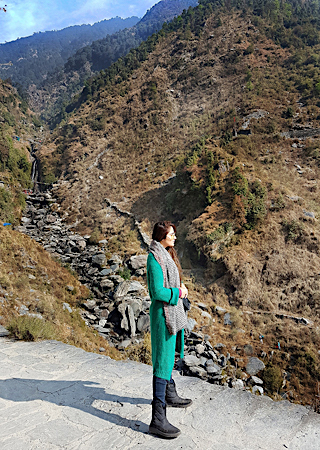 – It’s dramatic landscape fringed with local culture, towns with varied legacies, trendy shopping districts, bustling markets, mouth watering local street food and verdant valleys are enticing enough to be on every travellers list. It’s the epitome of Asian sophistication. 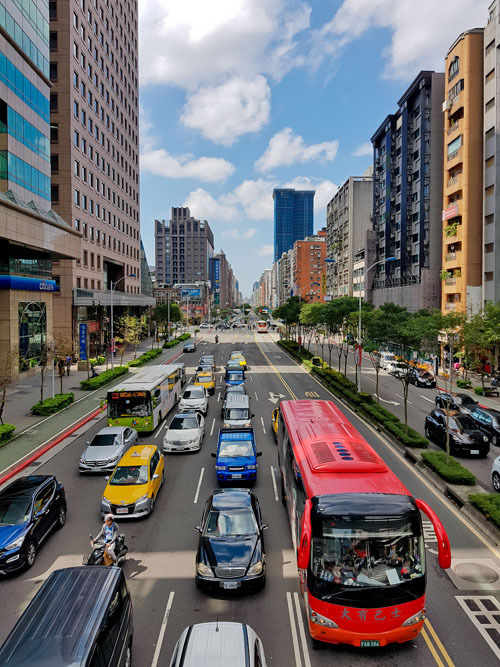 – If you’re bored of the same old places in the Far East and you are looking at something that is economical, undiscovered and beautiful then Taiwan is the place to be. It is easily accessible and so beautiful. – The food on this island is just so good. They even have a toilet themed restaurant. – Commuting is super convenient thanks to the High Speed Railway. You can travel from the North to the South of Taiwan in two hours. 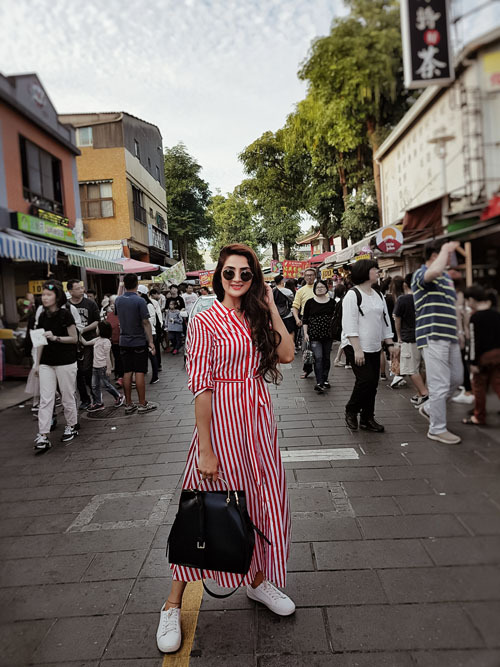 – It is a pleasant mix of nightlife, shopping, delicious food, culture, architecture, festivals and above all it’s the upcoming tourist destination. 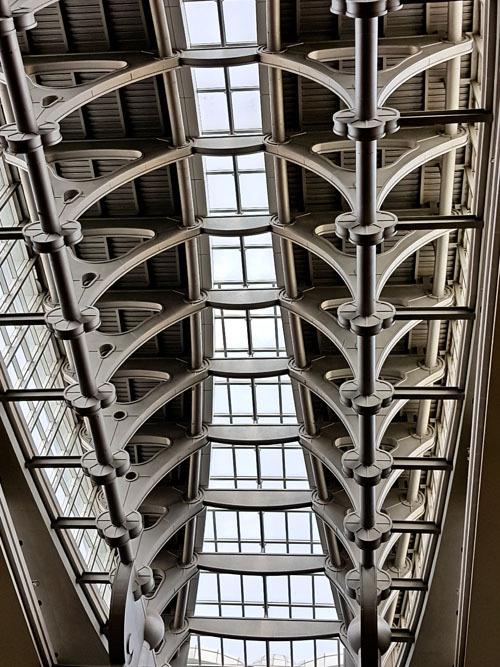 – The place has a fascinating history so if you’re a museum buff or love learning about tradition, art and culture, this is where you want to be. 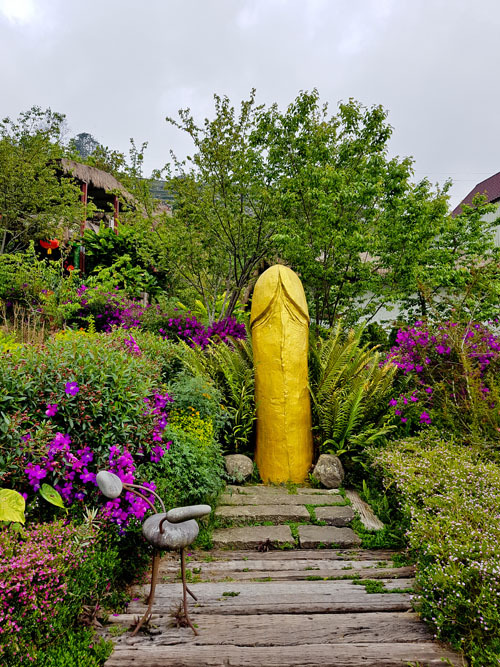 – Jiufen: A tourist favourite, this relaxed laid back town in the mountain is known for it’s filming spots, street food, teahouses and the cobbled streets. It is an hour from Taipei and makes for a perfect day trip. 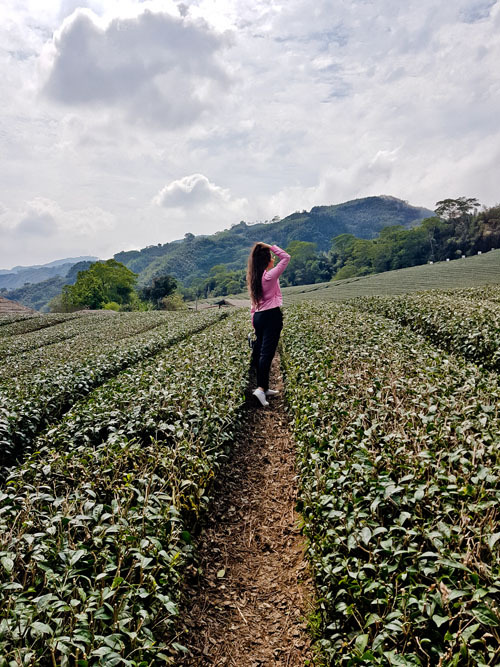 – Shifen: Located in the Pingxi District and just 50 mins from Taipei, this quaint town is full of rich traditions and interesting attactions. 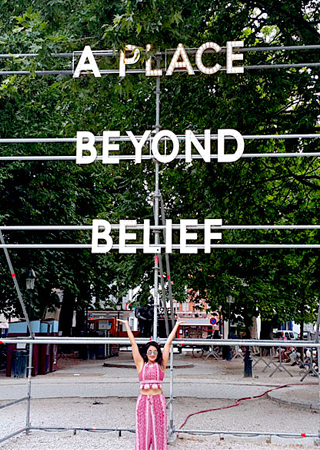 Release sky lanterns, visit the waterfalls,walk down the old street and suspension bridge, there’s a lot to do there. 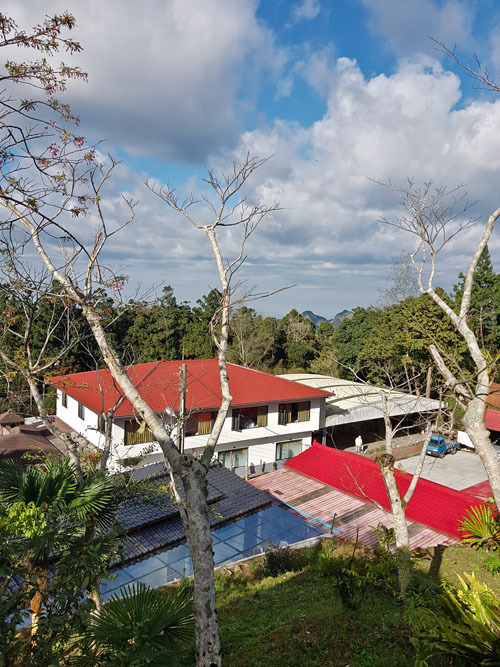 – Cingjing Farm: This scenic mountain countryside farm is in the Central Taiwan and a quick retreat for those looking to escape the city life. – Tarako Gorge: Taiwan’s most popular tourist attraction and one of the biggest reasons for me to visit this country again, Taroko Gorge, is simply magical. Nestled between massive marble cliffs, green forests, blue streams this spectacular canyon has so many things to do. 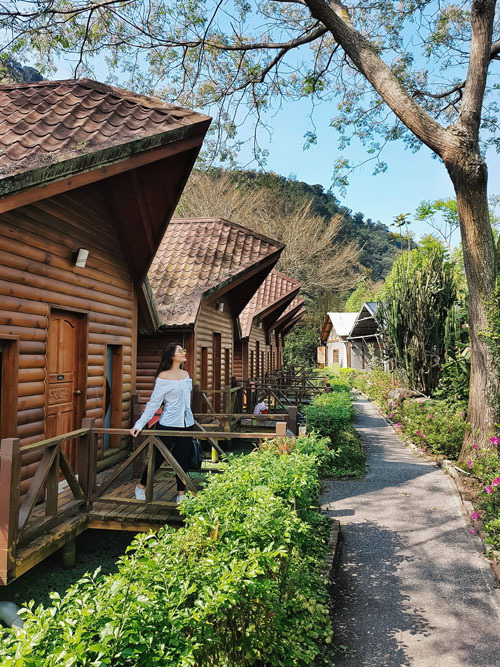 – Hualien : Known for its untouched beauty, lush landscapes, emerald waters and hidden caves, a visit to Hualian is an absolute must. If you travel between April to October you might get lucky and spot dolphins, sperm whales and sting rays while sailing. 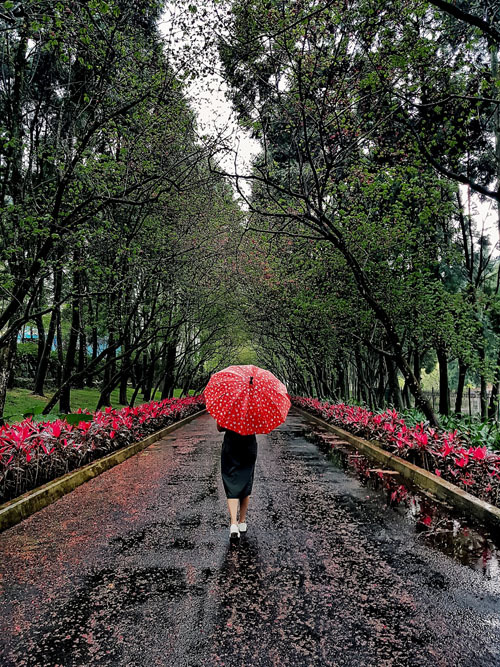 Taiwan has a sub tropical weather with more humid and wet summers and a mild winter. Usually Northern Taiwan is cooler in temperature than the South because the Tropic of Cancer divides this country. We travelled in the end of February and it was just perfect. The weather was pleasant all day with a few surprise showers. July to August is usually the peak season and also very hot. There are domestic flights but the High Speed Railway is super convenient and economical, definitely the best option to go around Taiwan. If you have a valid Schengen or US visa then you can apply for it online and will receive the permit within a minute. It was really hard to find these dollars in Dubai so I exchanged my currency at the Taipei Airport. Just make sure to change Taiwanese dollars back to your local currency before leaving because the exchange houses in Dubai did not accept my left over dollars. Language: Mandarin Chinese is the language usually spoken in Taiwan. English is a bit of a hit and miss in this country. If travelling to the outskirts or little villages would highly recommend keeping the Google translator handy or a local guide. I would also recommend learning a few important words in Taiwanese like Thank You, Please, Sorry, Good Morning etc. Taiwan is one of those places that I’ve wanted to visit since I was a little girl. It’s literally on the other side of the world from me physically and culturally, which is where the intrigue lies. 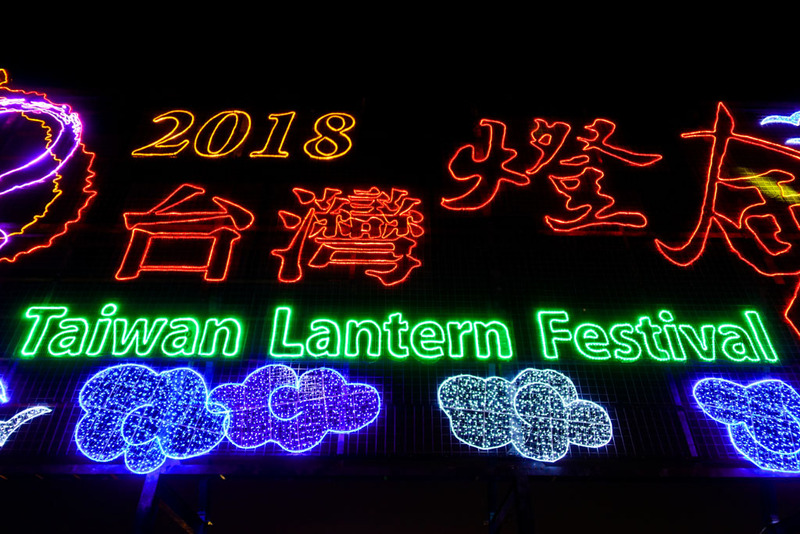 I had no idea that there was a separate kind of lantern festival! 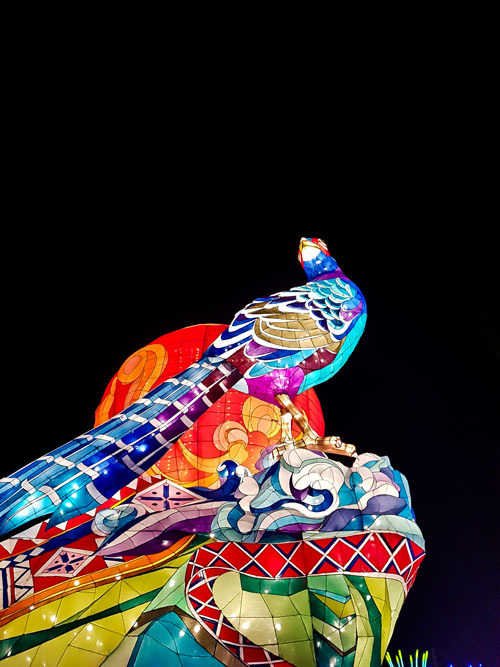 I know that releasing the sky lanterns is fun, but the one in Chiayi looks so beautiful and definitely worth a visit! 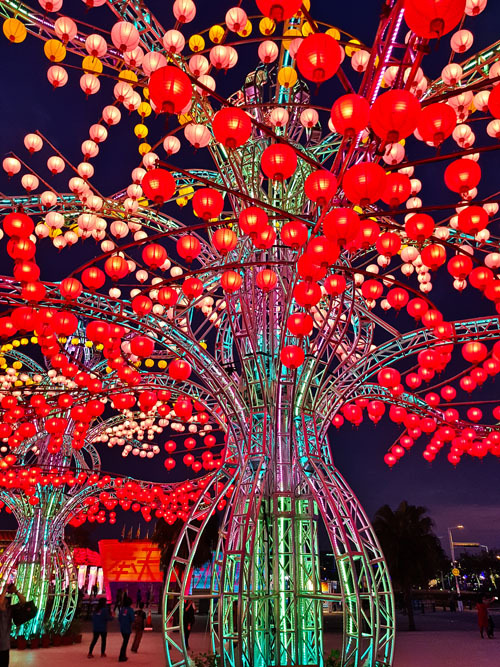 Taiwan should definitely be on your list. It’s a beautiful island and so diverse, there’s something for everybody. 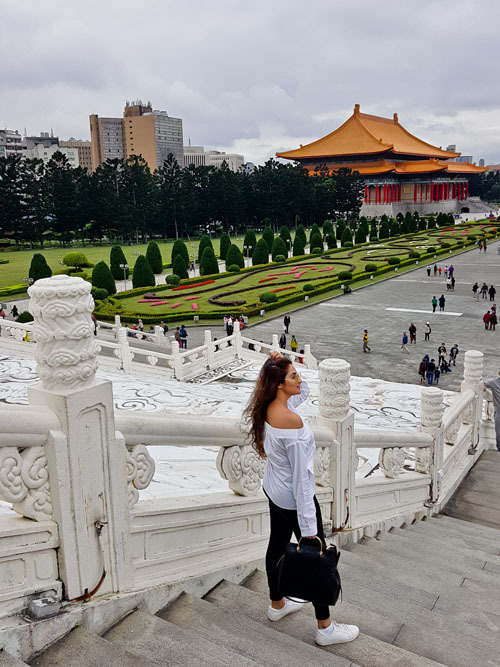 What an incredible post about your time in Taiwan, I don’t think you missed anything here! Would really love to visit here, for the food culture, and the landscape too. 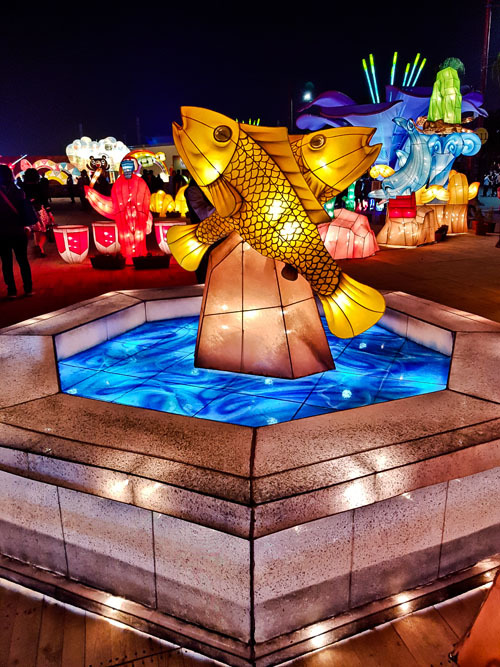 The lantern festival looks so pretty, and your photos show off the place well! A lovely country and city too. 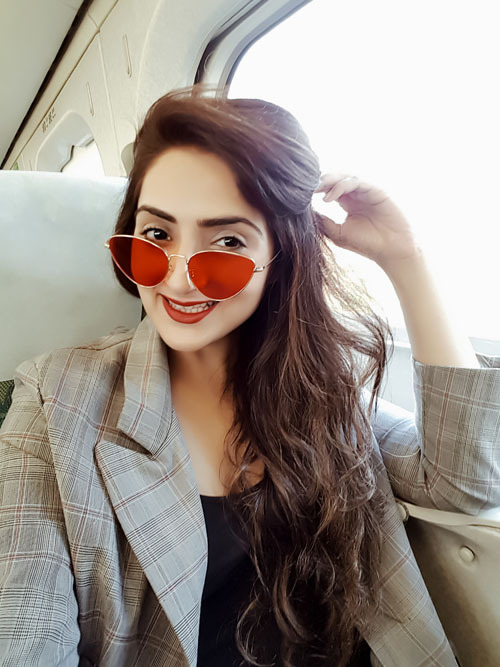 Thank you 🙂 Glad you liked the post! Hope you visit Taiwan someday..
Who knew Taiwan had so many beautiful places. 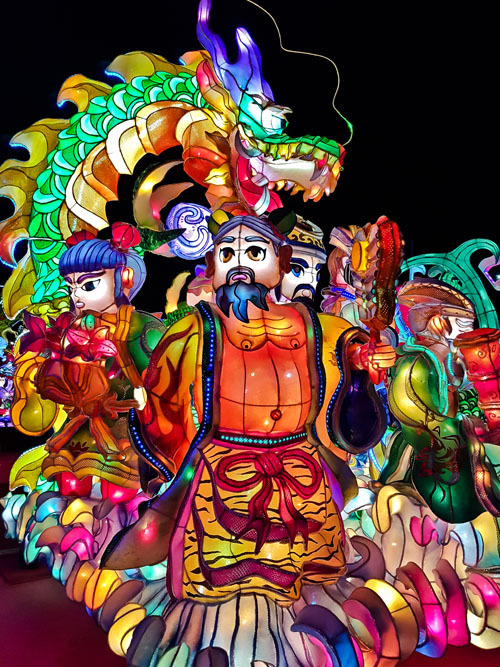 I love those glowing sculptures at the Lantern festival and the farmstay looks like fun. Incredibly detailed and informative post! I’ve been dying to go to Taiwan ever since I found out there was more to it than just Taipei. The nature and scenery looks absolutely stunning. Yes mine was a media trip hence it was compact and tight. But would definitely recommend two weeks to explore the island. 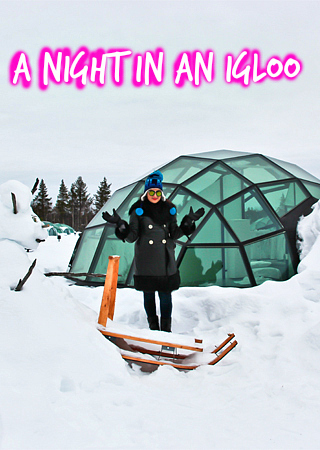 There is so much to do and considering you will be spending atleast 3 nights everywhere, 14 days is good enough. 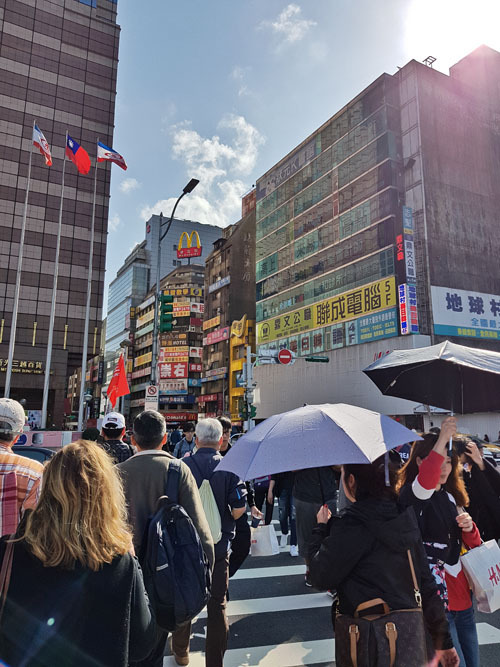 Taiwan looks epic and it seems like you had the most perfect weather in February time! I would definitely consider this time of year too. Absolutely. Taiwan will be great all year round! Taiwan is in my wishlist. And your wonderful narration just ignited my desire to be there. Great work!